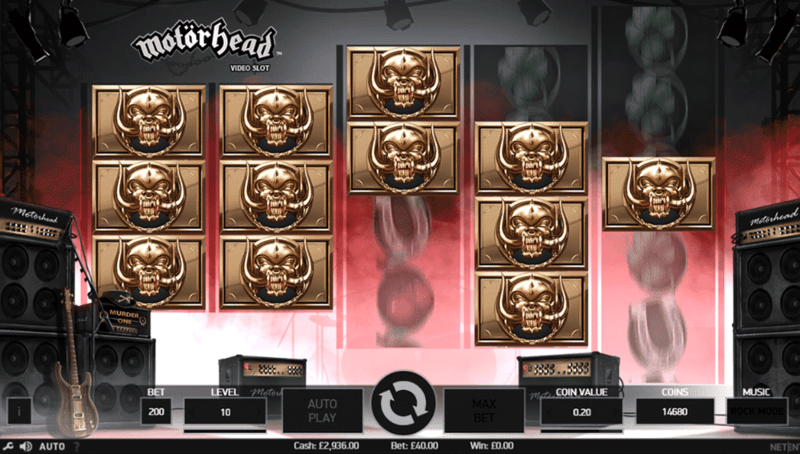 Check out our mega top slots guide created especially for all you online slot fans out there! Whether you are an avid slots player or a newbie to the slots scene, we have created one of the most comprehensive ‘Top 30 Slots’ guides ever seen on the World Wide Web. After much deliberation, we have finally narrowed down a list arguably the best 30 online slots ever made, plus because we didn’t want to leave you with just a slot name, we have added a short description of each of slots we believe thoroughly deserve their ‘Top 30’ status. We must admit that this was no easy feat. In fact, it was one of the toughest tasks we have undertaken during our online gaming history. There are thousands of online slots, and we really had to dig deep and eliminate some slots we really did not want to leave out, but when it comes to naming just 30 slots out of thousands of nominees, we realised we had to be harsh! When we say harsh, we mean to say that some slots we enjoy playing had to be cut..
Why do we believe this the most accurate Top 30 Slots Guide Ever? Our experience with online slots goes back over 2 decades. We were there when online slots first hit the wires of the internet making their way to people’s home PCs. Furthermore, we have been there throughout the vast technological changes the online casino industry has overcome throughout the years. From PCs to iPods, to smartphones, to tablets, and beyond. 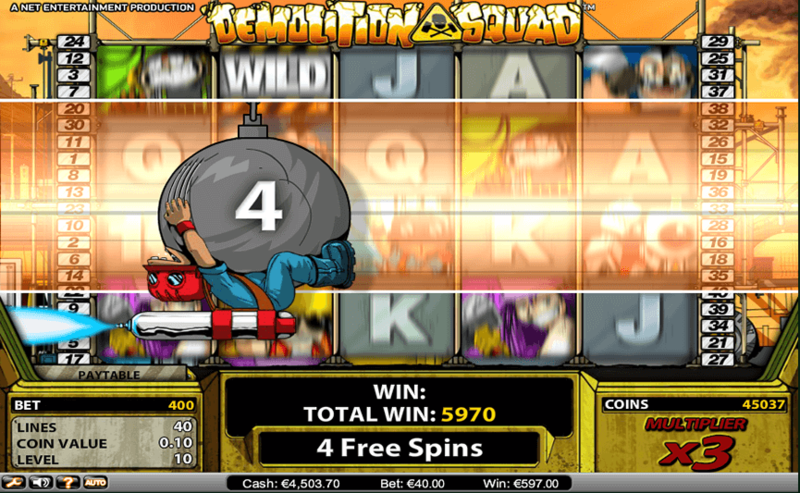 Our team of avid slots fanatics have been there, done it, and bought the T-shirt. Every bonus round, new feature, free spins, progressive slot, new 243-ways to win slot, and every new idea that has been released within the online slots industry, our team of slot pros have tried and tested all of them. From the introduction of wild reels, stacked symbols, and wilds to the expansion of 243 ways to 1024 ways slots, we have been there to see the action unfold. There is literally nothing we do not know about slots. Admittedly, we all have our own tastes in features and themes, so we cannot be 100% accurate and profusely apologise if you feel we missed out your favourite slot during this review. However, if you are one of those people, and you see slots mentioned here that you have not yet tried or tested, then we urge you to give then go – you never know, we might just surprise you by introducing what could potentially be your new favourite slot of all time! Sit back, read on, and enjoy the ride! We will kick this list off with possibly the most popular online slot of all time and one that is always busy at the online casinos. 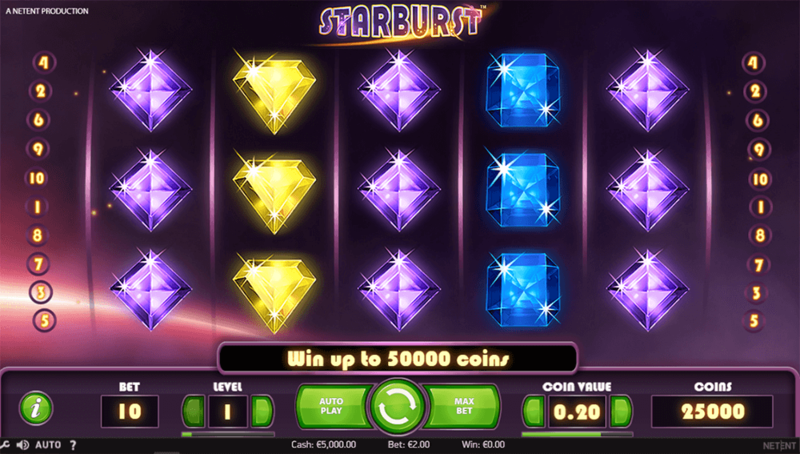 Starburst by NetEnt is a fantastic 5-reel, 20-payline video slot with an RTP of 96.10%. 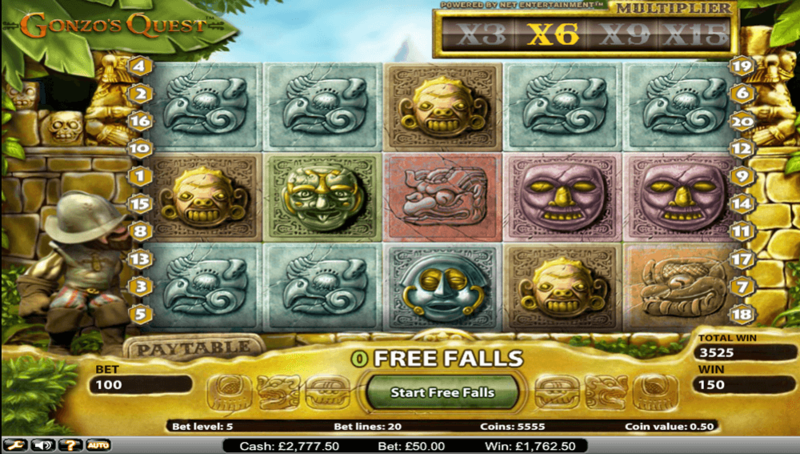 Most of its popularity is down to its low variance which means regular payouts and plenty of entertaining action. Starburst has been designed with a classic feel but with stunning graphics and its best bonus feature is that of the expanding wilds. These can land on any of the three middle reels, and when they do, they will expand to fill the entire reel sometimes on all 5 giving you multiple payouts. Not only that, when these expanding wilds land, they will lock the reels they landed on. 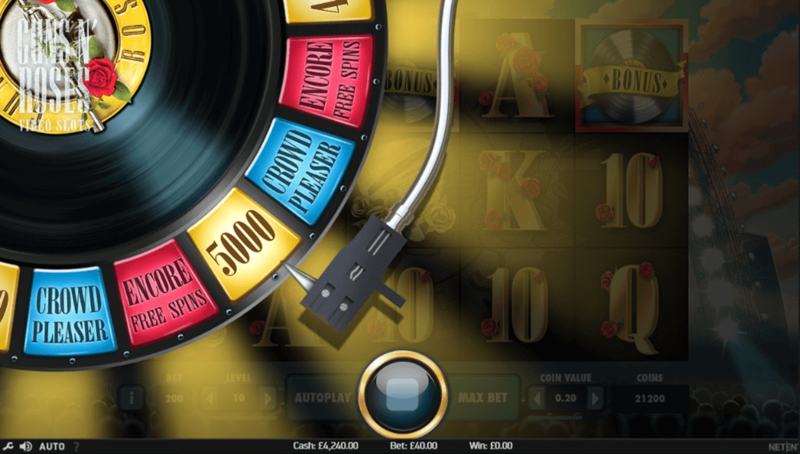 You will then be given free re-spins on the remaining reels where any new winning combos will be paid out accordingly. 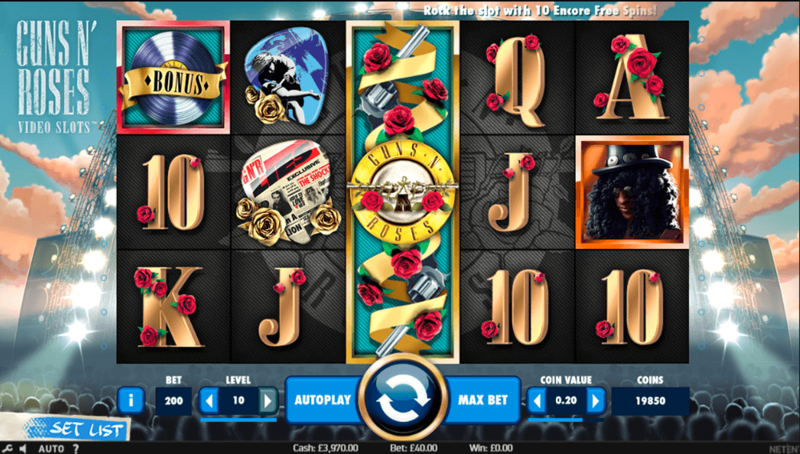 As the winner of the best slot machine in 2017, Guns N’ Roses certainly has to be on this list, and once you have played this NetEnt masterpiece while rocking to the sound of the world-famous tunes written and produced by the iconic rock band, you will see why this slot is an award-winner. 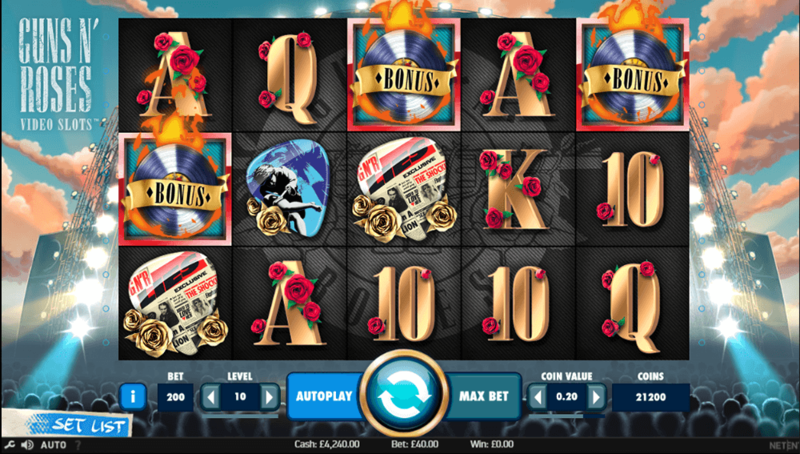 Popular due to some fantastic graphics, a bunch of lucrative features and its rocking soundtrack, Guns N’ Roses is one of those online slots that just has to be tried at the online casinos. The reel format is 5-reels and 20-paylines, and there is an RTP of 96.98%. 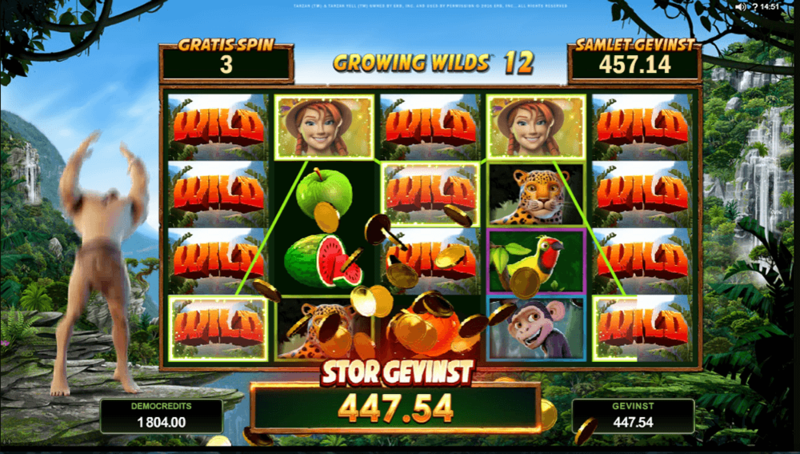 It also comes complete with amazing features such as expanding wilds, free spins, multipliers, wild symbols, scatter symbols a bonus wheel and a hugely entertaining bonus game. Whether you love the rock band or not, there is no doubt in our mind that you will love the highly addictive action that it provides. 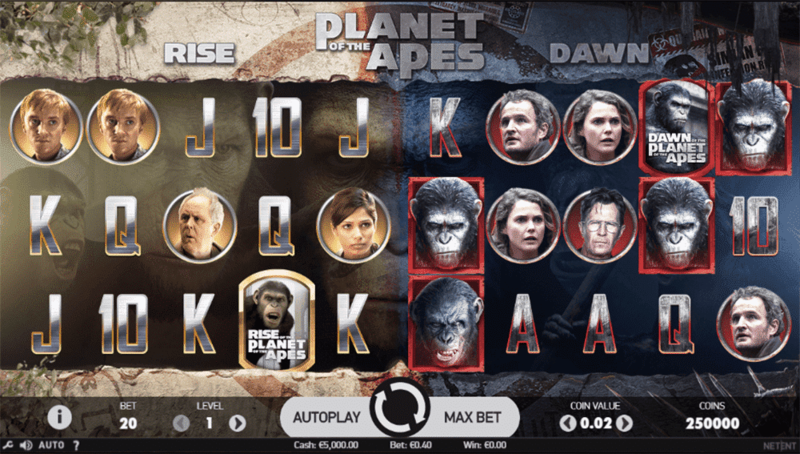 Planet of the Apes is another excellent online slot that comes from the NetEnt stables and one of their most recent releases. Having been given the license to release a slot based on the popular movie franchise, NetEnt has once again churned out something of amazing quality. 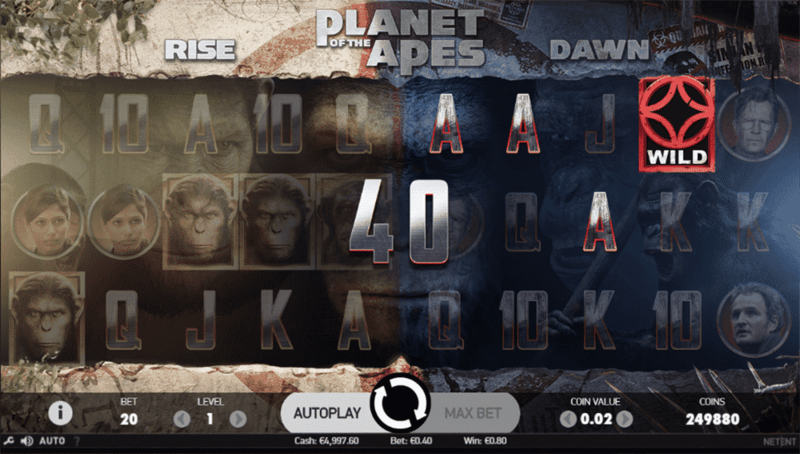 Featuring dual-reels of 5-reels and 20-paylines apiece, one for each of the first two movies, Rise of the Planet of the Apes and Dawn of the Planet of the Apes, this unique feature-packed slot is already proving hugely popular among online casino players. 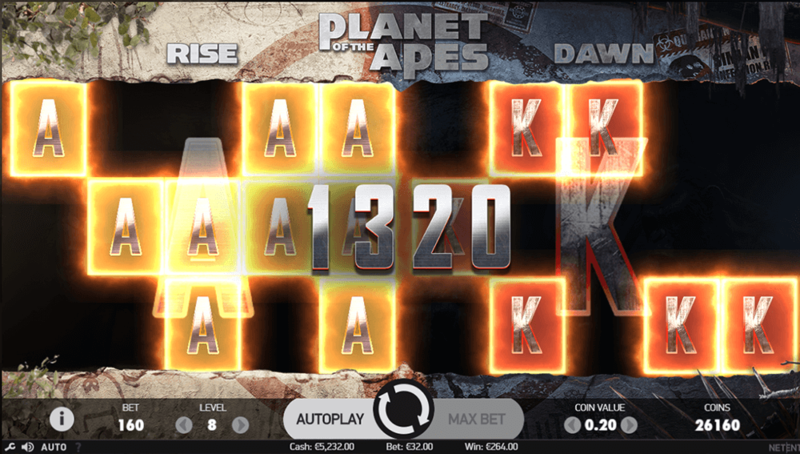 Containing some of the best graphics and animations we have ever seen to date on an online video slot, Planet of the Apes has an RTP of 96.33% and offers a medium to high volatility, which means you can expect some very handsome payouts. 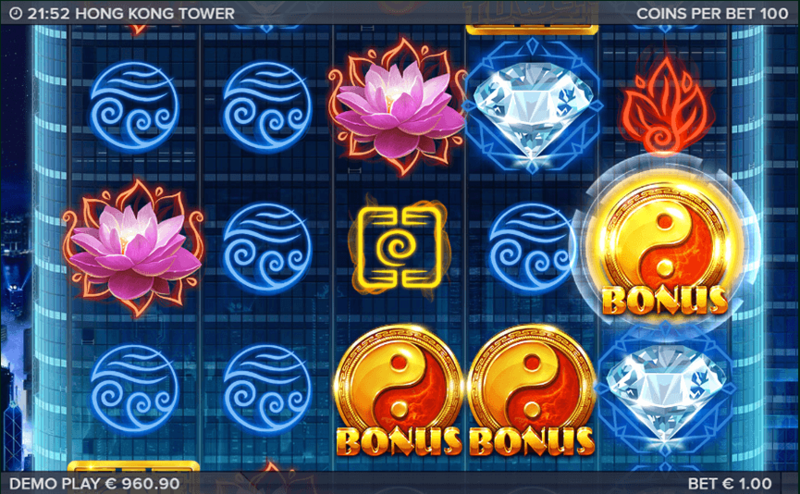 Furthermore, complete with bonus features such as free spins, stacked wilds, scatter symbols and a bonus game for each of the two movies, there are plenty of different ways for you to bring in the wins. 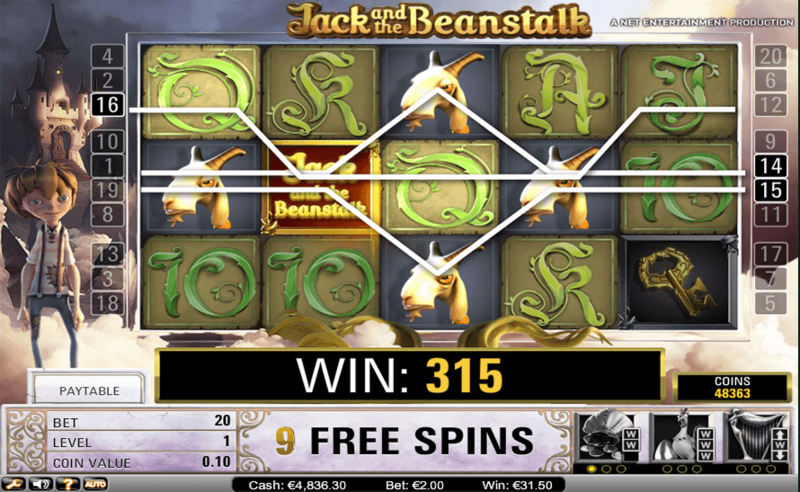 A firm favourite among high-rollers, Jack and the Beanstalk is an older online slot that is still going strong at the online casinos. Popular due to a very high variance which means a long time between payouts, nonetheless usually very big when they arrive, you can see why players with big budgets love taking their chances on this NetEnt classic. 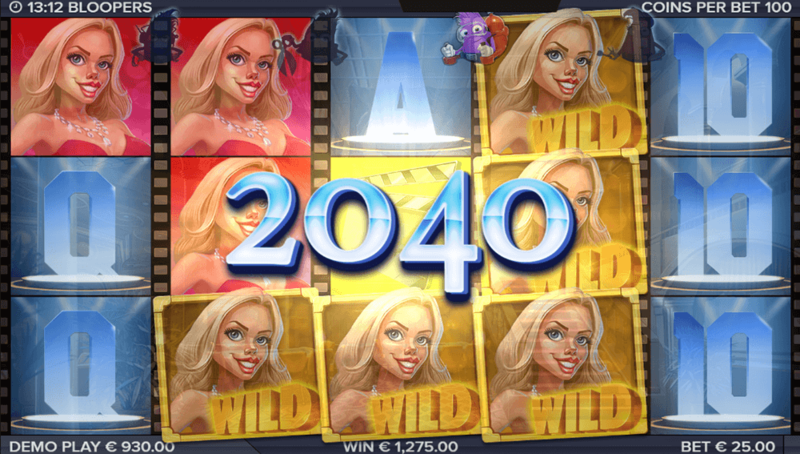 With 5-reels, 20-paylines, an RTP of 96.30% and features such as free spins, scatter symbols, expanding wilds, walking wilds and a bonus game, this beautifully animated 3D video slot has more than enough to keep most players interested. Despite being around for some time now, you will still find hordes of players enjoying it at the online casinos. 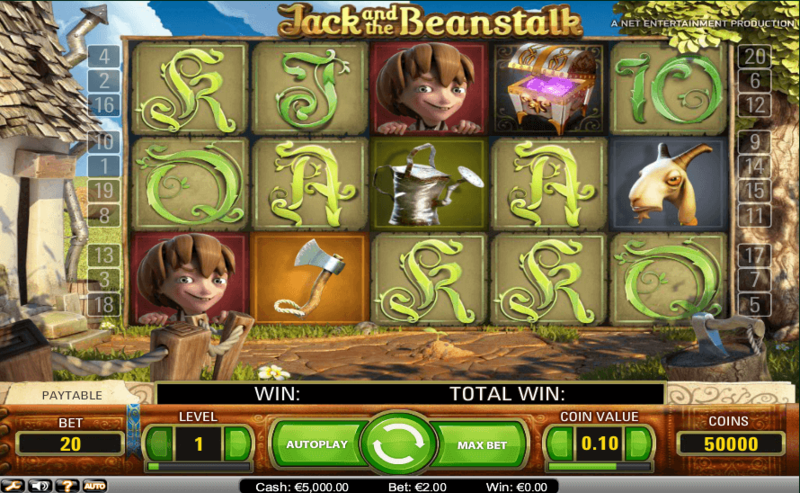 Themed around that fantasy based fairy-tale that we all remember as children, Jack and the Beanstalk this slot has the complete package when it comes to video slots. Who knows, perhaps the magic beans could lead you to some ‘giants’ in terms of payouts. Having been released by ELK Studios at the end of 2016, Wild Toro has been earning rave reviews from many players at the online casinos. 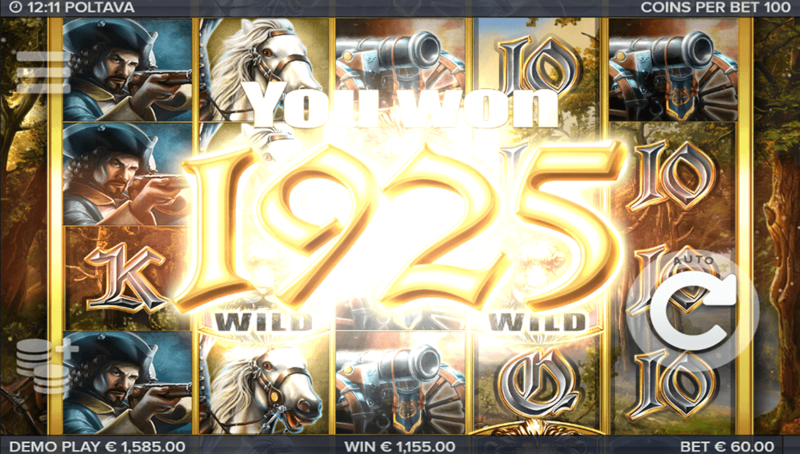 As a medium to high variance slot, Wild Toro is known for the big payouts that it is capable of dishing out. The jackpot on this online slot is a staggering 2,250x the total bet placed and when you consider that you can bet as much as 100.00 per spin, you are talking about a potential payout of 225,000. That is not to be sniffed at right? 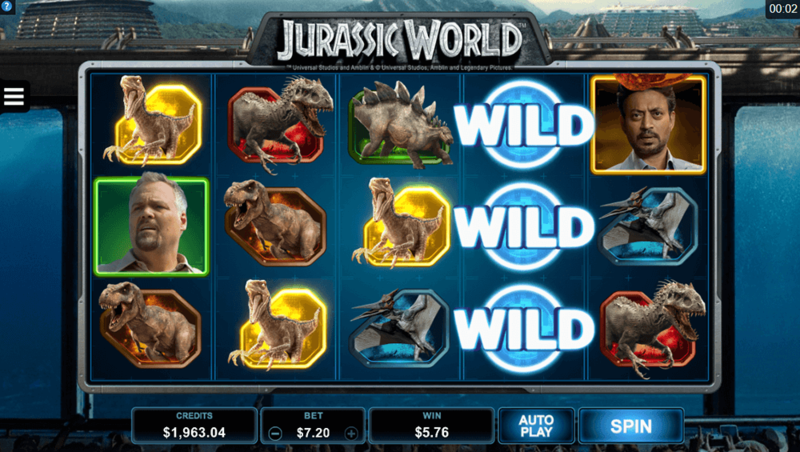 Even if you don’t manage to take down that whopping jackpot, you still have the potential to find some other great payouts via a bunch of game features like walking wilds, wild symbols and re-spins. 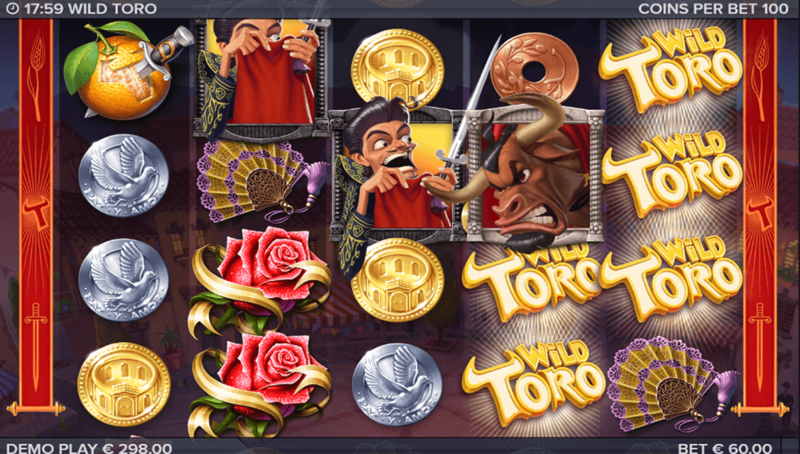 As Wild Toro is a modern slot, you can also be sure that the graphics are all in HD, and the animations sublime. 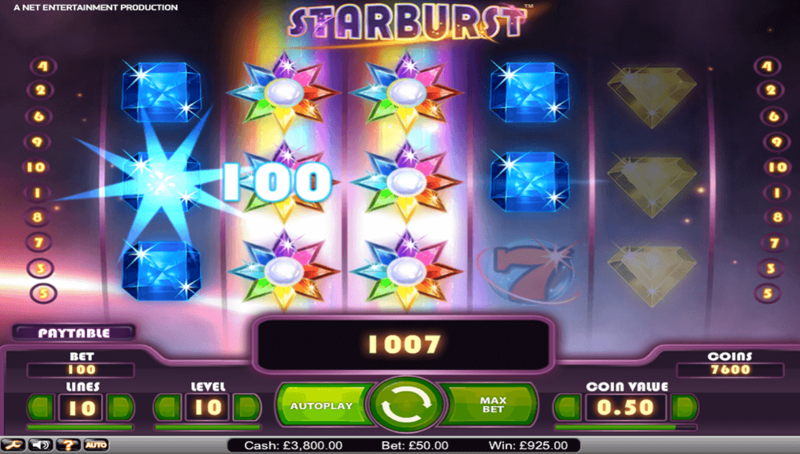 You can also be sure that this slot has been designed with mobile technology in mind playable on almost any device capable of connecting to the internet and steaming online games. 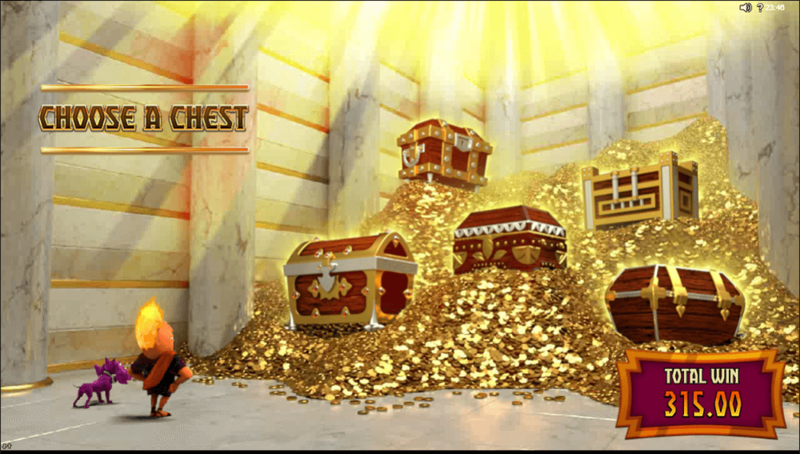 If you were to ask any players that have been playing online slots frequently for many years to name five of the best online slots of all time, we would bet that the majority of them would name Gonzo’s Quest by NetEnt among those five. Launched in 2010, this 20-payline slot carries an RTP of 96.00% and it has cascading reels which means the symbols all fall into place from above. When wins are created, those symbols will disappear and more symbols from above will fall into the spaces that were vacated. 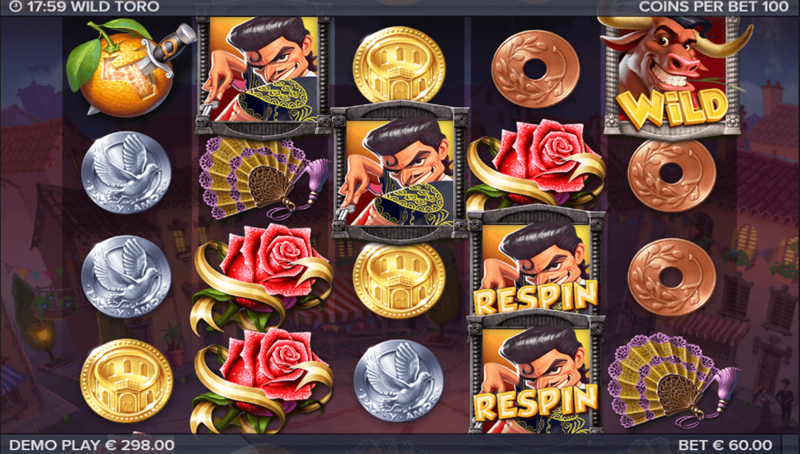 That cascading feature can bring in multiple payouts after each spin as the new symbols drop into place but there is also multipliers that are attached to the rewards above the reels. 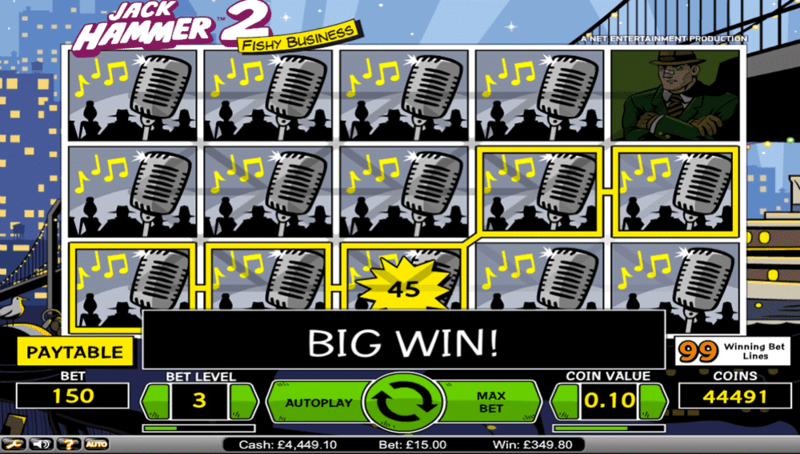 After each consecutive win as a result of the cascading tiles, this multiplier increases by one which means there is some good potential for big wins. 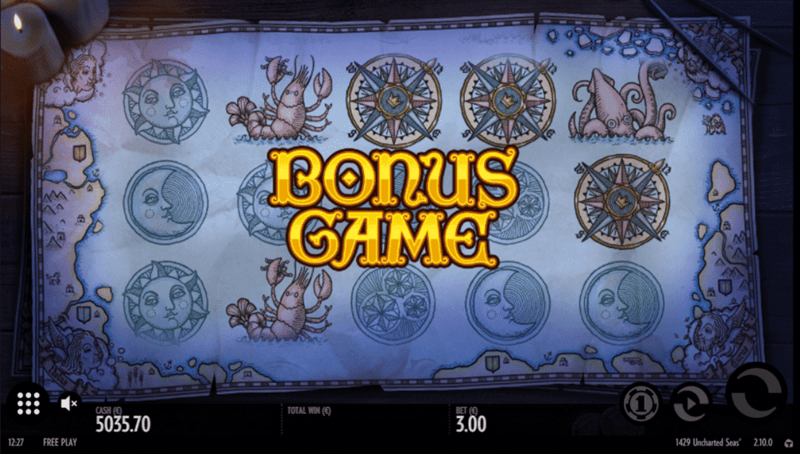 Other bonus features on Gonzo’s Quest include free spins, wild symbols and scatter symbols. Ted is another online slot that has only recently hit the online casinos having come out earlier this year and there is an obvious reason as to why it is so popular. 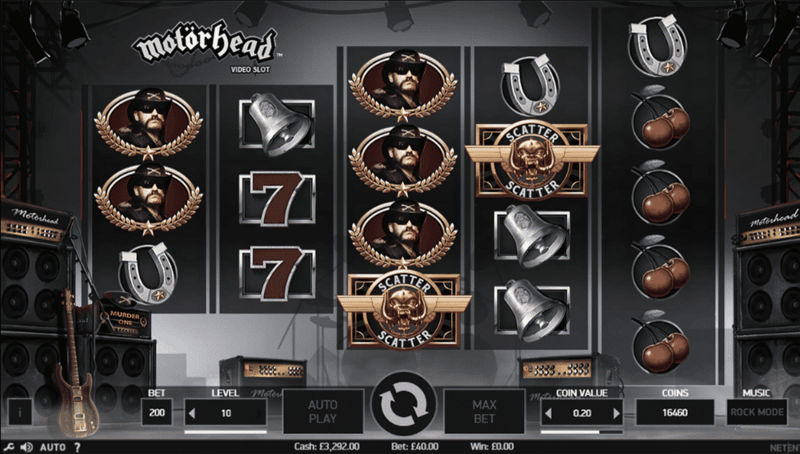 Bonus rounds – probably the most we have ever seen in an online slot. Developed by Blueprint Gaming, Ted is the online slot adaption of the hilarious movie of the same name that is about a talking teddy bear called Ted. With an RTP of 95.81% and a low to medium variance, you can expect some fast-paced action on this 5-reel, 20-payline online slot and you will soon see that there is never a dull moment to be had. 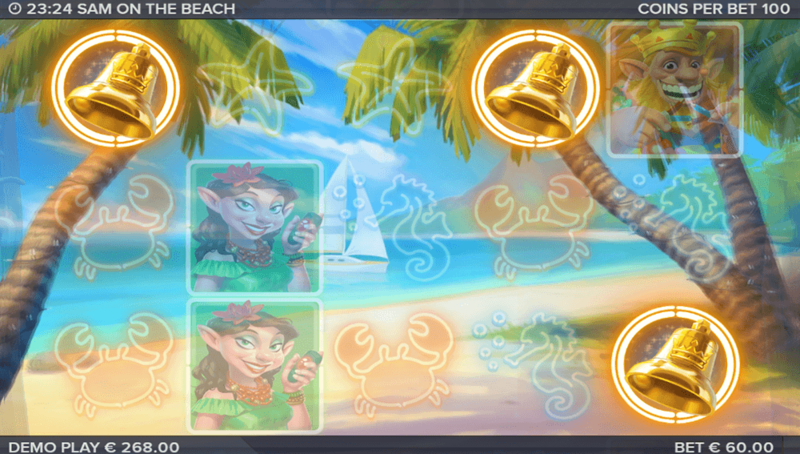 There are five different unlockable bonus rounds which are unlocked when you land three scatter symbols on your reels. Every time you unlock the bonus round you automatically move up to the next one, so you will need to unlock it five times to see all of them. However, it doesn’t end there as there are also 6 other bonus rounds that can occur randomly during any spin when the ‘Ted’ character wakes up from his sleep to give you the potential for some handsome payouts. 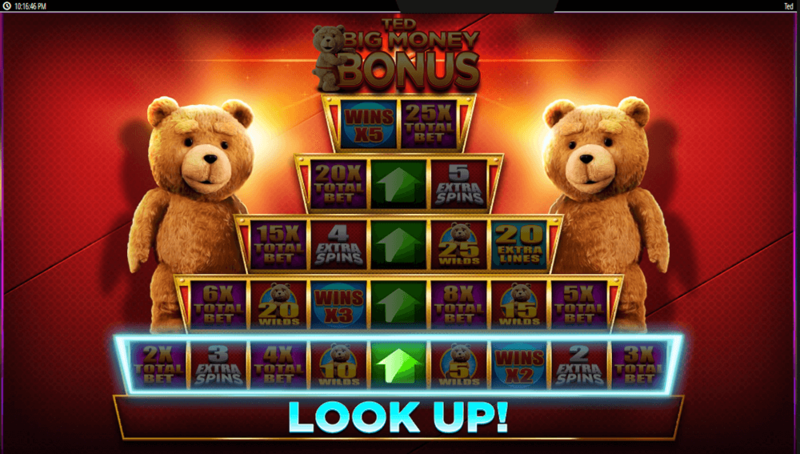 Check it out if you have not already as Ted has all of the attributes needed to be classed as a top-notch online slot. 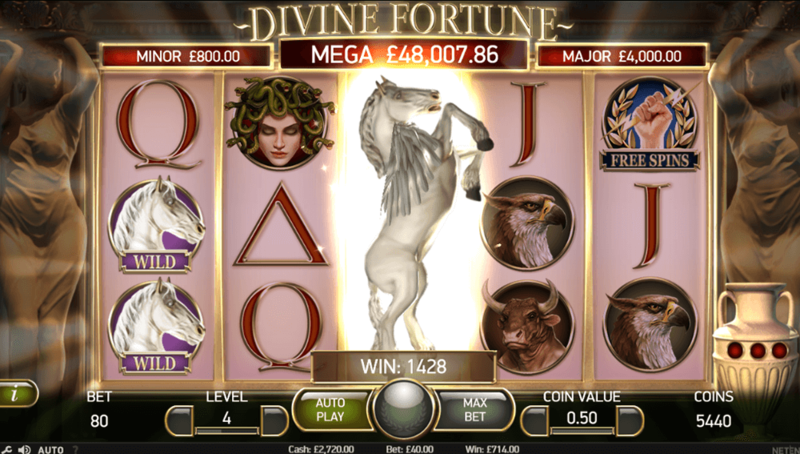 Another slot that has become a favourite for many players out there is Divine Fortune by NetEnt. Having played it ourselves we can tell you that the main reason for its popularity is the three different progressive jackpots that players have the chance to win. On top of that, this 5-reel, 20-payline slot with an RTP of 96.59% also comes packed with some excellent features such as free spins, expanding wilds, scatters, wilds and a lucrative jackpot bonus game that could award as much as 60,000. 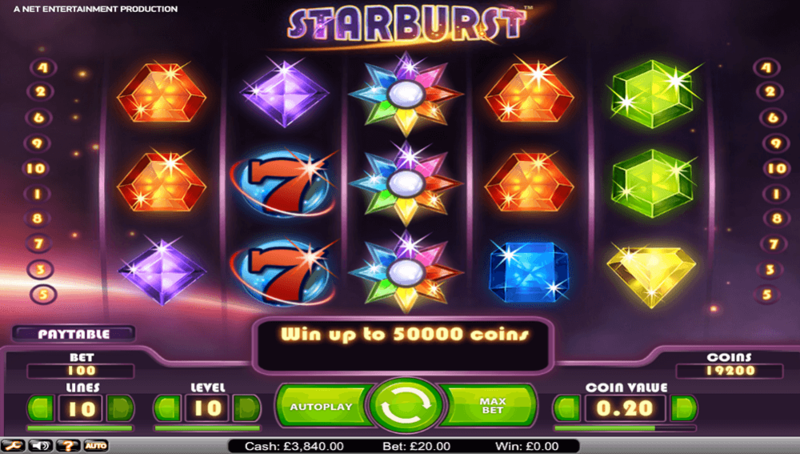 Containing some excellent graphics and some smooth animations, this is an online slot that we feel will continue to be popular for many more years to come. If you have not tried it out yet for whatever reason, you really should be adding it to your list for the next time you take a trip to your favourite online casinos. 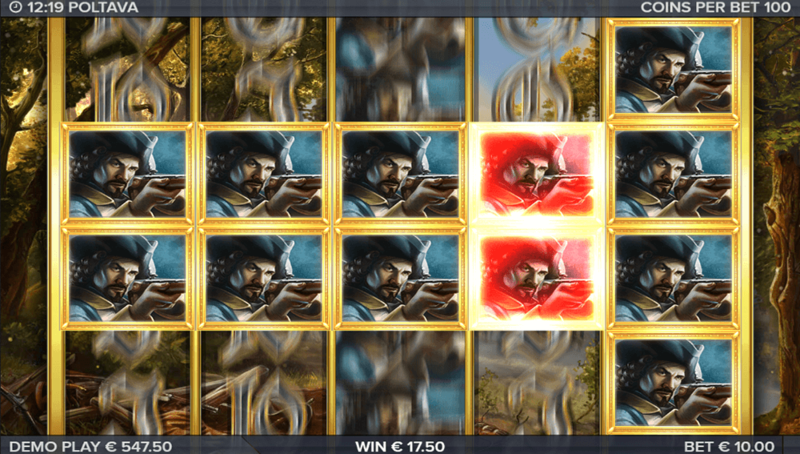 Poltava – Flames of War is another impressive online slot by Elk Studio that really does not get the credit that it deserves. Released last year, this online slot continues Elk Studio’s tradition of creating online slots that are completely unique to anything else out there. What is particularly good about this high variance online slot is the unique bonus features that it has such as its lucrative Marching Reels Respin Bonus and Flames of War Free spins bonus. Each of these innovative bonus rounds is not only fun but also have the potential to pay out some fabulous wins. 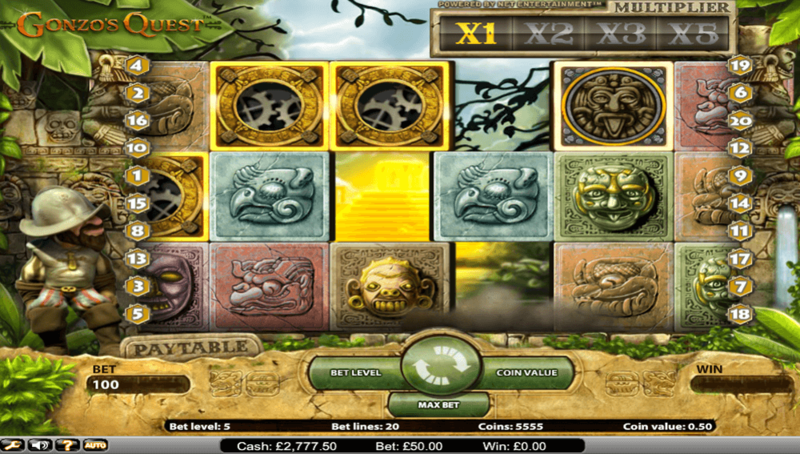 Graphically this online slot also amazes with some top-notch HD graphics and the soundtrack is also infectious. 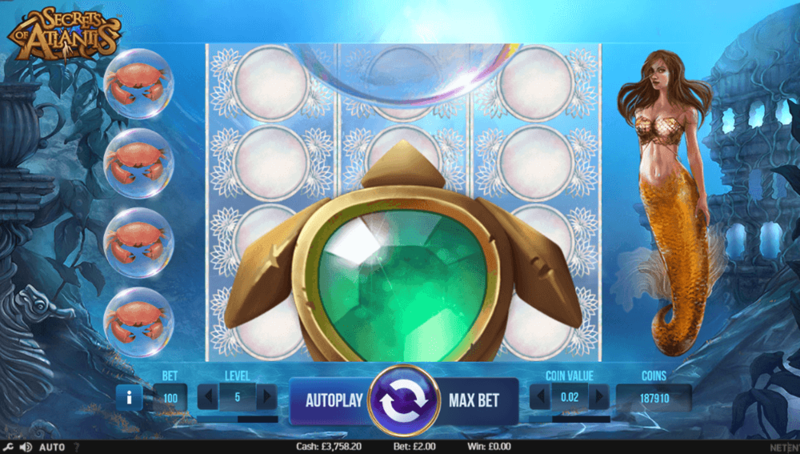 With an RTP of 96.4%, this 5-reel, 40-payline online slot is one of our favourites at the moment and we are sure that most players would agree with us. 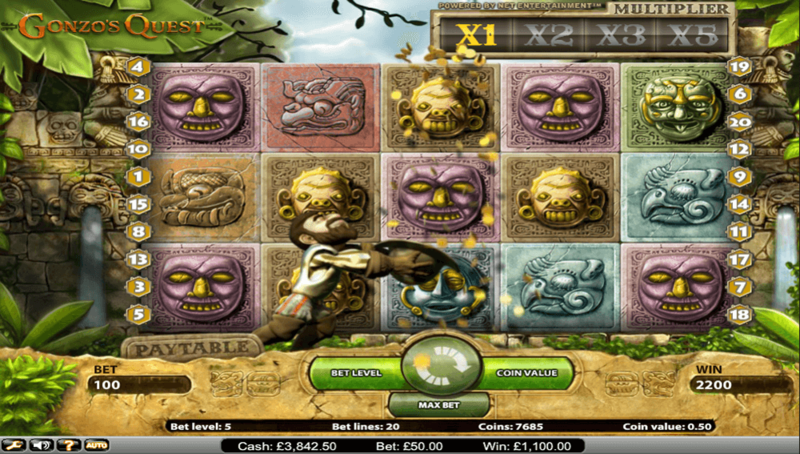 Thunderkick Games have been making a big name for themselves over recent years due to the quality online slots that they have been developing and once you see 1429 Uncharted, one of their finest, you will quickly see why. Packed with quality features, stunning visuals that have been designed in a very creative manner and some fast-paced action, 1429 Uncharted certainly deserves its place on this list. Among the biggest reasons for the popularity that this online slot has at the online casinos is the superb return-to-player percentage of 98.6%. When you consider that low edge and add the fact that this online slot has a medium variance level, players really are getting some solid bang for buck with their wagers. Throw in the possibility of being rewarded with up to 50 free spins and other excellent features such as stacked wilds and some gorgeous graphics and animations, and you have yourself some online slot. Following on from the hugely popular Guns N Roses slot that you will also find in this list, NetEnt released Motorhead in 2016. One of the most anticipated online slot releases last year, this 5-reel, 76-payline slot has definitely lived up to the hype. Fantastic graphics and a banging soundtrack are just the icings on the cake with Motorhead as its what is underneath that impress the most. Packed with features and enjoyable gameplay, you just know that this site will continue to be popular for many years to come. With a low-medium variance and an RTP of 96.98%, you can be sure that there is plenty of entertainment to have and some regular payouts for you to bank as well. 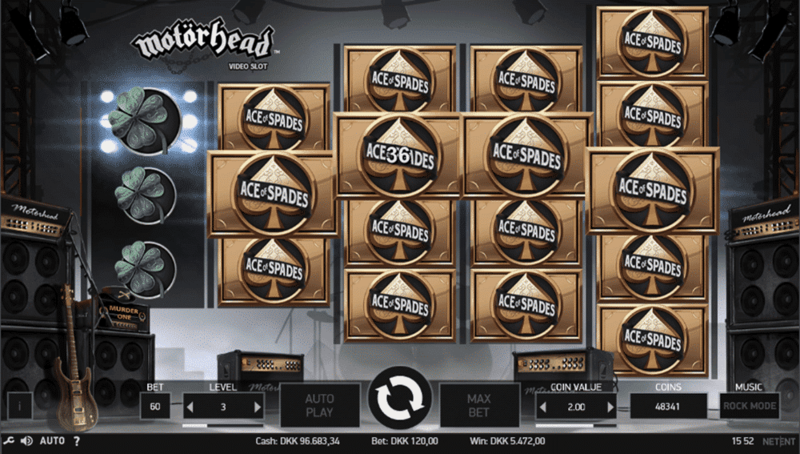 Even if you are not a fan of heavy metal, you can simply turn down the volume and still enjoy the fantastic gameplay that this online slot has to offer. This is a list of the 30 most popular online slots but this slot would make the list even if we shortened it down to 20 it is that good. Elk Studios feature quite prominently on this list and that just goes to show how impressive they have been with the online slots that they have developed. 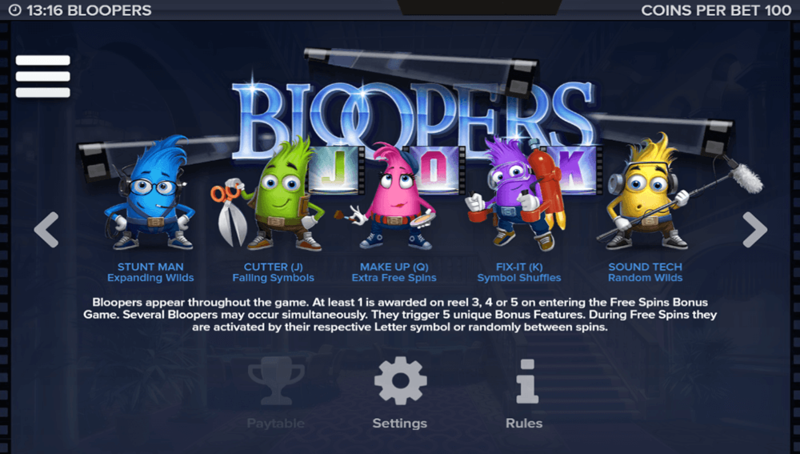 They have creative flair and that is shown once again in Bloopers, another highly enjoyable and featureful online slot. With a healthy RTP of 96.1% and a volatility that is somewhere between medium and high, this 243-ways-to-win slot has become a firm favourite with players at the online casinos. Bloopers are themed around a movie studio and all the goings on that occur when a new movie is in production. 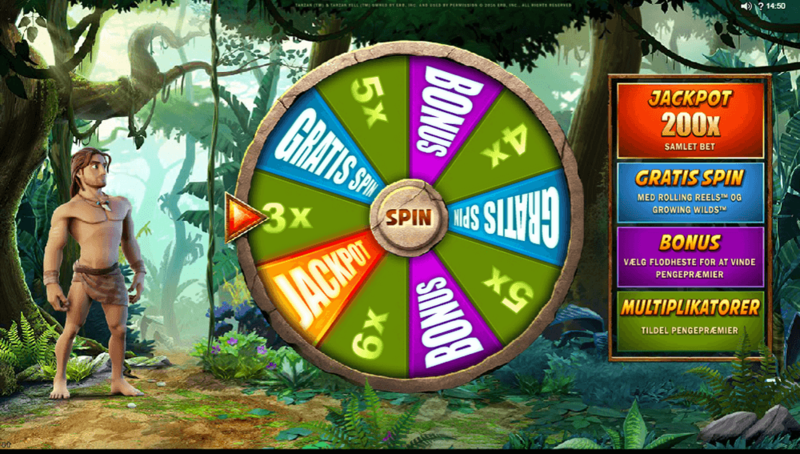 The free spins round is where the best action occurs and during the round you not only have sticky wilds that will no doubt help you to pick up multiple wins but there is also the chance of one of the main characters randomly activating one of four different additional bonuses. This could be anything between some additional free spins, falling symbols and expanding wilds. We highly recommend trying Bloopers out as we feel it is one of the best recent releases, we are confident it will become a firm favourite among most of you. Elk Studios have built a solid reputation for themselves over the years for not just churning online slots out for the sake of it. Instead, they spend a lot of time on each slot to ensure that they are not only entertaining and lucrative but are also very different to what is already out there. Sam on the Beach is no exception to this rule and is easily worth a spot on this list. An RTP of 96.30% is fairly standard for a medium variance 243-ways-to-win slot but as with most slots from Elk Studios, the real magic is in the fantastic game features. 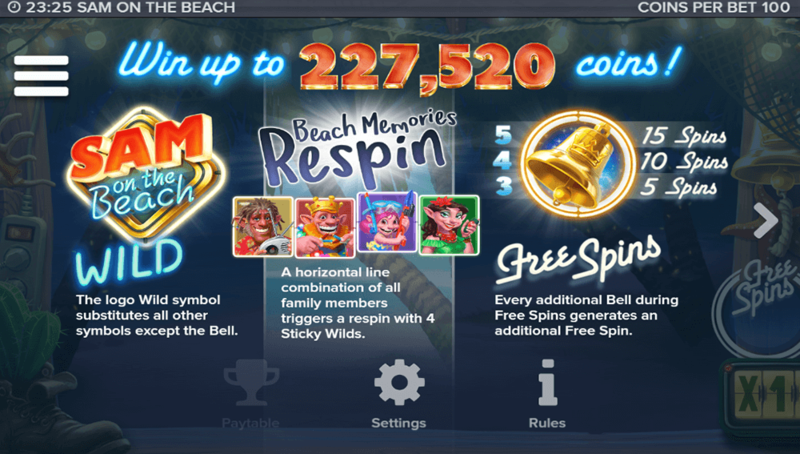 You have the Beach memories respin feature that contains sticky wilds, a free spins round and a special bonus for each of the game’s characters such which could be sticky wilds, sticky multipliers, bonus multipliers and imploding symbols. 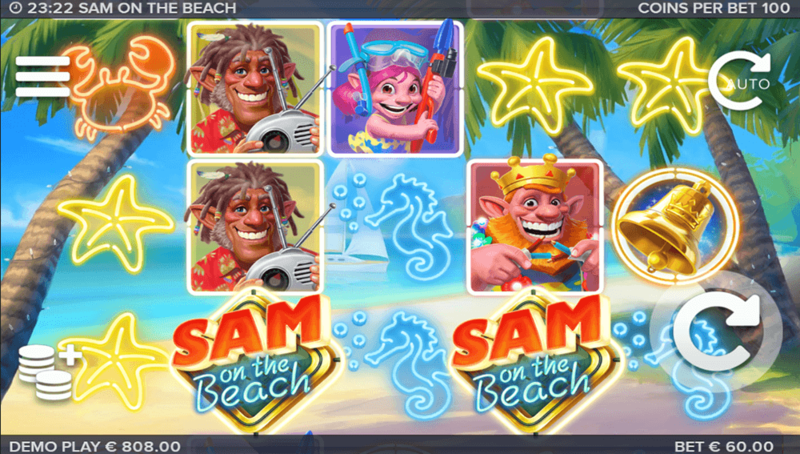 Graphics are superb and this Sam on the Beach has been designed to work on all computers and mobile devices no matter the operating system. All in all, this is a must-try online slot for any player looking for a top-quality experience at the online casinos. Microgaming has developed a fair amount of popular online slots down the years and another title of theirs that deserves a place on this list is Hot as Hades. Containing 5-reels and 20-paylines, this low to medium variance slot is mainly popular due to some fantastic bonus features. 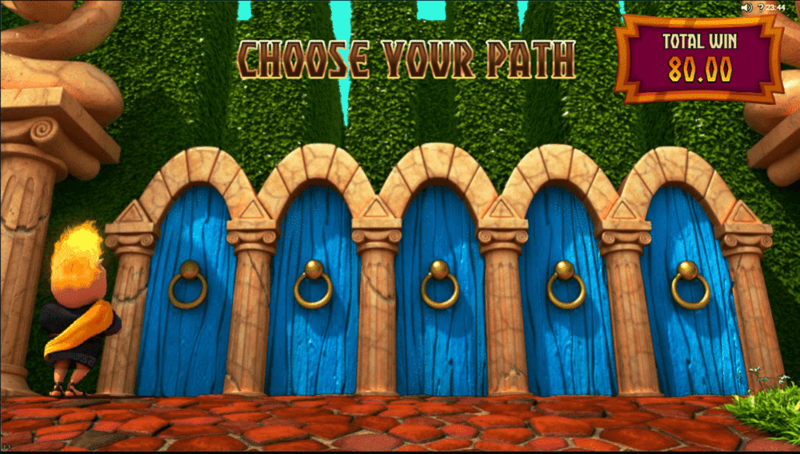 The Quest for the Crystal Helm is a five-tiered bonus round and is definitely the pick of the features on Hot as Hades. Throughout the five levels, you will get the chance to win random payouts by choosing items to reveal what is beneath them. 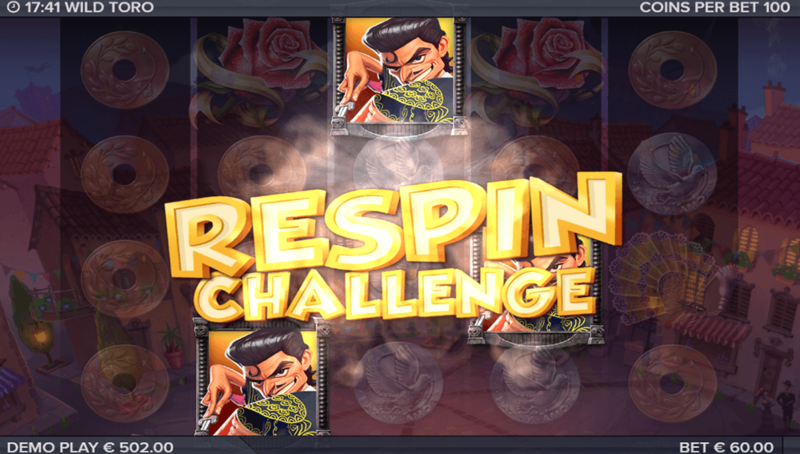 A free spins mode is also available to give you the further potential for wins. 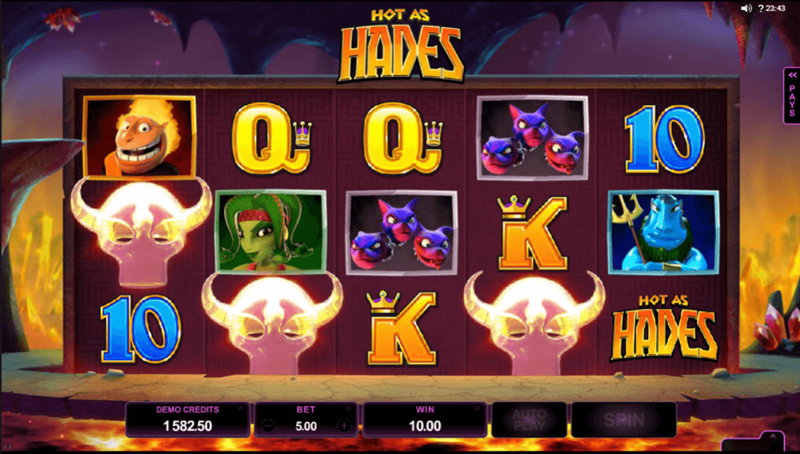 You will also be impressed with the graphics that Hot as Hades has to offer and while the Greek mythology theme has been done to death by online slots, this is definitely one of the best of them. Having been developing online casino games since online gambling was even a thing, you can be sure that Microgaming knows exactly what they are doing. Tarzan is another of their better online slots and it always has plenty of players lining up to play it at the online casinos. 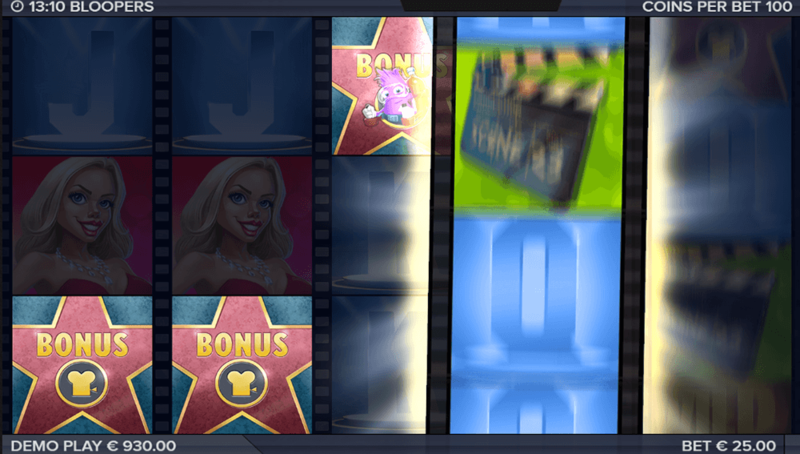 5-reels and 40-paylines are where the action takes place in this slot that has been themed around the famous movie of the same name. 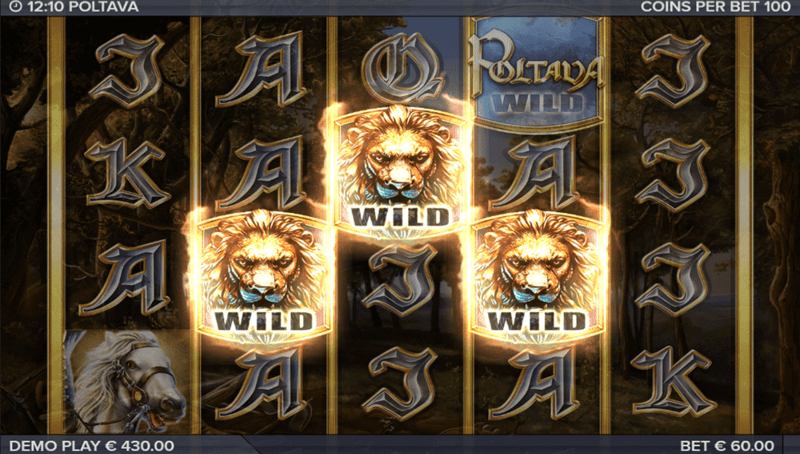 Wild symbols, scatter symbols, a bonus wheel, free spins, random cash prizes, growing wilds, stacked wilds, rolling reels and multipliers are among the extensive list of features that this 96.48% online slot has to offer players. On top of all that there is a big local jackpot that could be worth as much as 40,000 for anyone betting the max bet of 40.00 per spin. Winning that massive jackpot of 1,000x your total bet will require you to land five scatters on the reels at the same time. 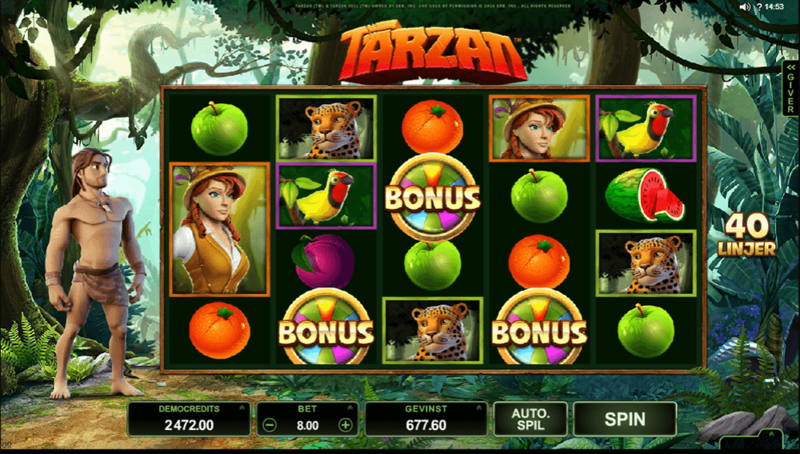 Tarzan is definitely a great online slot and one that every player should try out at least once. NetEnt is the second oldest online slot developers behind Microgaming and over the years they have developed some absolute classics. Jack Hammer 2 can be added to that list due to having a good selection of feature, some fabulous HD graphics and animations and finally because of its very high RTP of 97.10%. 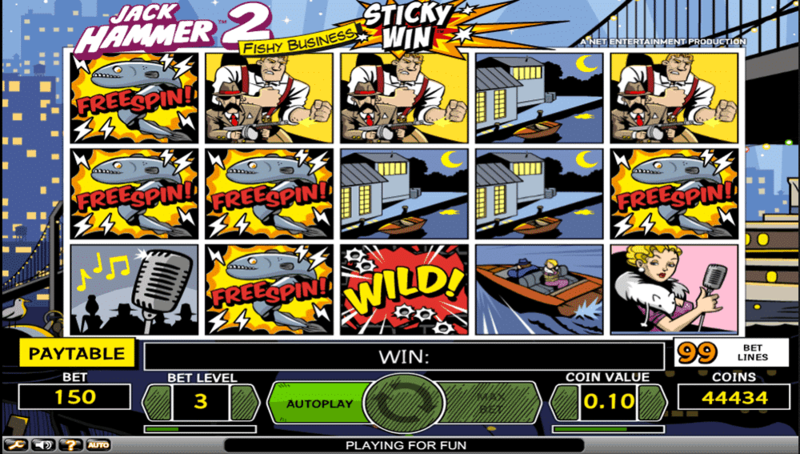 As another of their Marvel-themed slots, this slot is themed on the popular Jack Hammer comic book hero. Despite being a few years old now, this online slot is still going strong at the online casinos and is, therefore, more than deserving of a spot on this list. Anyone that wants to get the best value for their money is going to love Jack Hammer 2 as the online casinos will only have an edge of 2.90%. not only that but with so many excellent features such as sticky wings, free spins, wild symbols and scatter symbols, you just know that you are going to have a shot at claiming some big wins on this 5-reel, 99-payline slot. NetEnt have quite a few online slots on this list but when you consider they have been developing online slots for close to twenty years, you would expect them to have mastered it by now. When Pigs Fly 5-reel, 20-payline online slot that carries a medium variance and an impressive RTP of 97.00% which was released during the middle of last year. Since then it has become a firm favourite at the online casinos due to the excellent graphics it serves up and a free spins round that increases the ‘ways-to-win’ after each of them. 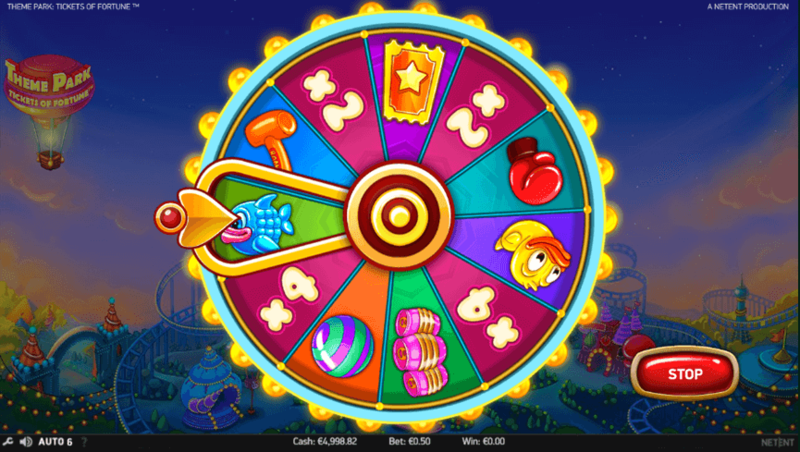 There are five free spins that are awarded and by the time you get to the fifth one, you are essentially spinning with 3,125 ways-to-win. When Pigs Fly is certainly a unique online slot that you will notice as soon as you see the reels as it is in a cross-shaped format. We are big fans of uniqueness however and When Pigs Fly is definitely worth being on this list. If you have not had a few spins on this slot before, you really should be adding it to your list for your next visit to the online casinos. Pink Elephants makes an appearance on this list as one of Tunderkick’s latest releases. It has become surprisingly popular, and that popularity is probably down to a number of reasons; one of those being the fact that this is a 5-reel slot with 4,096 ways to win. Furthermore, with a medium to high variance and a jackpot of 820,000 on offer, players obviously like the idea of having the potential of winning amounts that have to be considered as life-changing. A good number of game features will also be a factor in the popularity of this 96.1% RTP slot as there is a lucrative free spins round as well as wild symbols and scatter symbols for players to take advantage of. We have a feeling that this online slot will be popular for quite some time and for that reason, we feel it definitely deserves to be placed on this list. Stunning visuals, smooth animations, a calming soundtrack and an eclectic mix of bonus features is no doubt the reason why so many VIP players love Secrets of Atlantis by NetEnt. You can also throw in a very impressive RTP of 97.10% and a medium volatility in as big positives for this online slot as well. All of the action takes place across 5-reels and 40-paylines but the majority of big wins will more than likely come from some innovative features such as nudge wild symbols and colossal symbols respins. 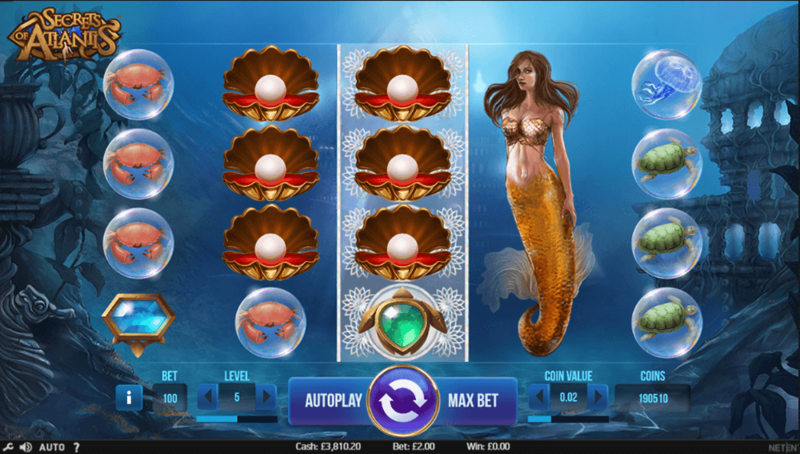 Upon first look, you will be amazed at the high-quality of graphics that Secrets of Atlantis has and the best part is that this online slot has been designed with mobile players kept firmly in mind. We strongly suggest checking this online slot out if you have yet to do so as we are confident it will become a big favourite for many of you. NetEnt once again has another online slot that undoubtedly earns its place on this list. 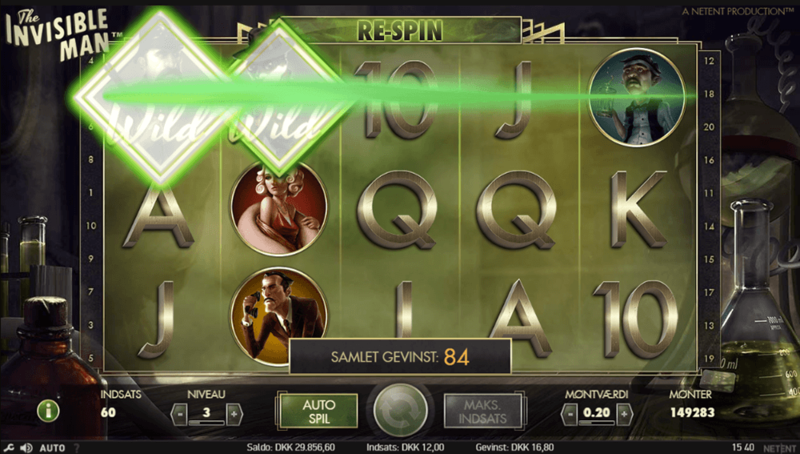 This time it is The Invisible Man, a 5-reel, 20-payline slot that contains some fantastic features such as roaming wilds, free spins, respins, a click me feature and two unique bonus games. On this pay both ways slot with an RTP of 96.40%, you can expect some regular payouts due to a medium variance level and will be able to add to that potential via the many features on offer. 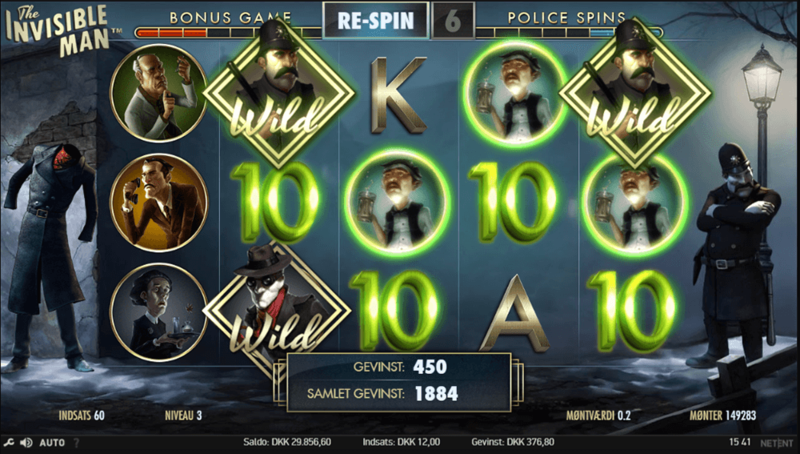 A police spins bonus game and a Griffins Rage bonus game are the two unique bonus games on offer. 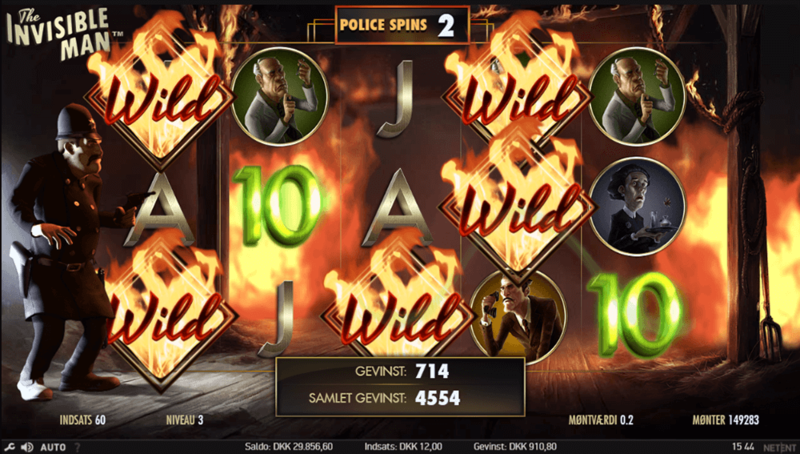 The Police spins, in particular, could see you net as much as 270,000 coins due to five flaming wilds appearing on the reels during the round. When you consider all of the above and then throw in some very impressive graphics, you have an online slot that is a must-try for all types of players. 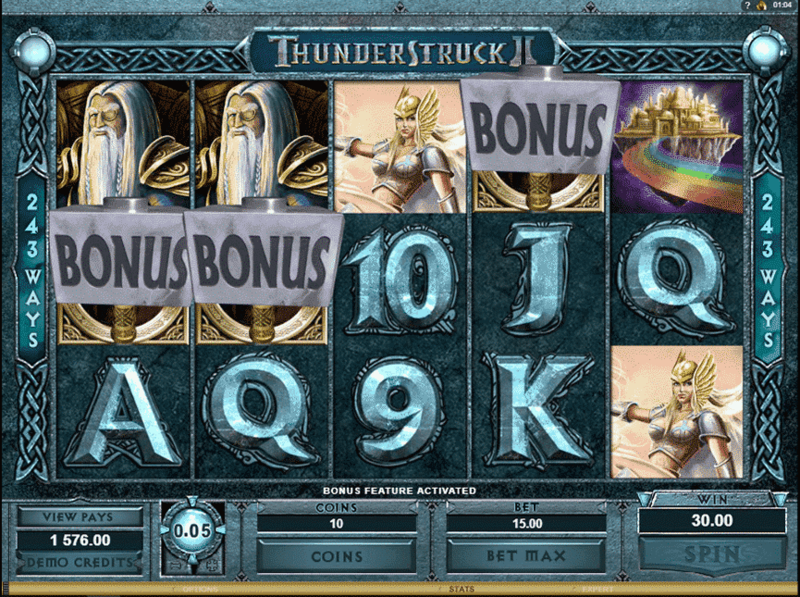 Thunderstrike 2 has been a favourite online slot for many players for a number of years now and it still holds up well despite the release of some other excellent slots in recent times. 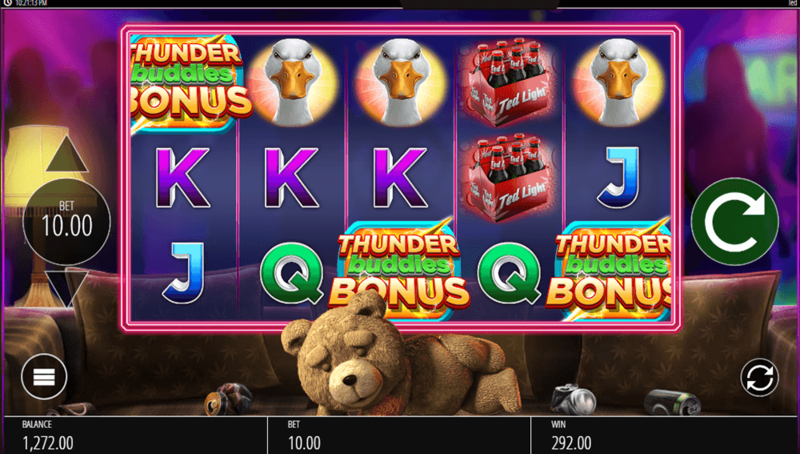 Microgaming are no strangers to producing top-quality online slots and they should be applauded for yet another one in Thunderstruck 2, a 243-ways-to-win online slot that could land mobile players as much as 2.5 million. With a healthy RTP of 96.65% and a medium volatility, Thunderstruck 2 gives players plenty of potential for wins and has a local jackpot of 121,500 coins. However, players that play on the mobile version of this online slot stand a chance at winning 2.5 million via a number of different bonus events. 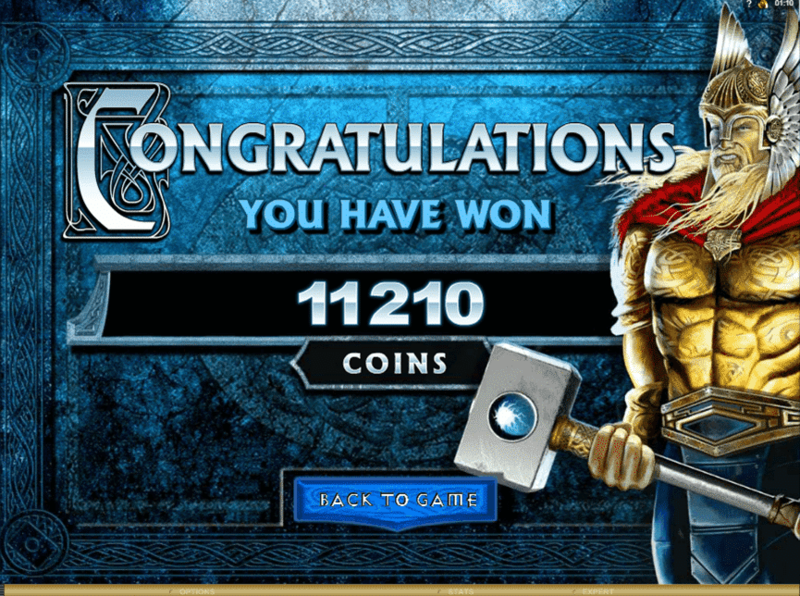 Three different bonus rounds are available for players as well, the Valkyrie bonus, Loki Bonus and Oden bonus with free spins and multipliers being awarded in emphatic style. We love this online slot as it has great features, big potential payouts and the high-quality graphics that Microgaming is renowned for. Despite its age, we still think that this is one of the best online slots around and definitely recommend that all players give it a whirl! Immortal Romance has long been a favourite for many players that love to spend time at the online casinos and it is fairly easy to see why. 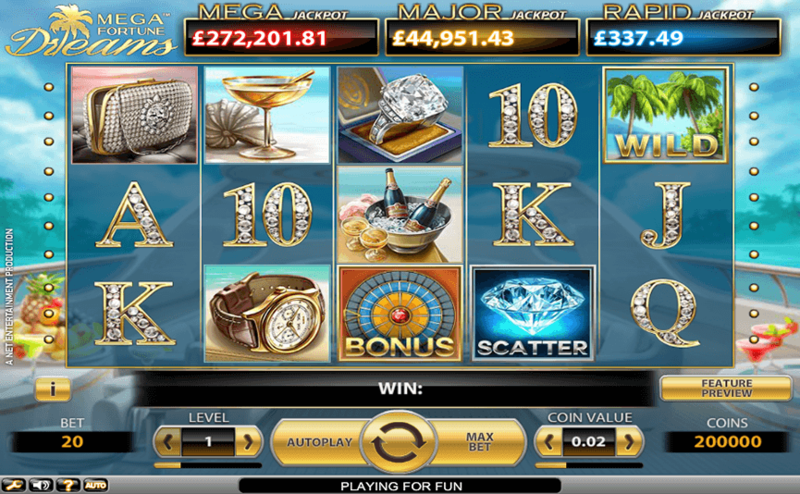 This Microgaming title features some fantastic graphics and animations, has an RTP of 96.01% that can rise to 96.86% and four bonus features that keeps players more than interested. 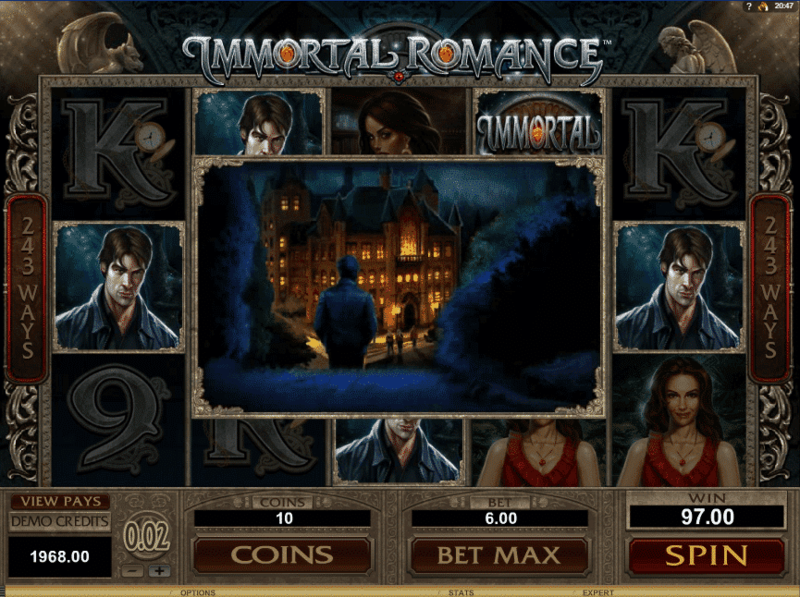 Immortal Romance is a 243-ways-to-win slot with a medium variance and is themed around the recent trend of vampire/human love stories that can be found in movies such as twilight. Those four bonus features are where the best fun can be found and you have one for each of the four main characters that featured in the slot. 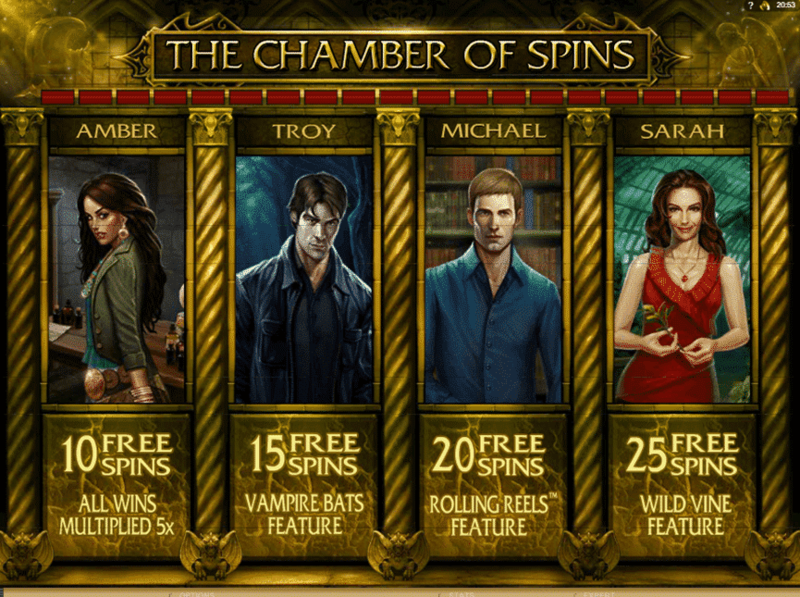 Each of these bonus rounds is a different variation of free spins and multipliers. As well as fantastic features, Immortal Romance also provides players with a slot that has some excellent graphics and gameplay that is difficult to match. Check it out and we are sure you will agree with our opinion to have it on this list. In fact, we would probably have it among the top 15 games in terms of popularity. 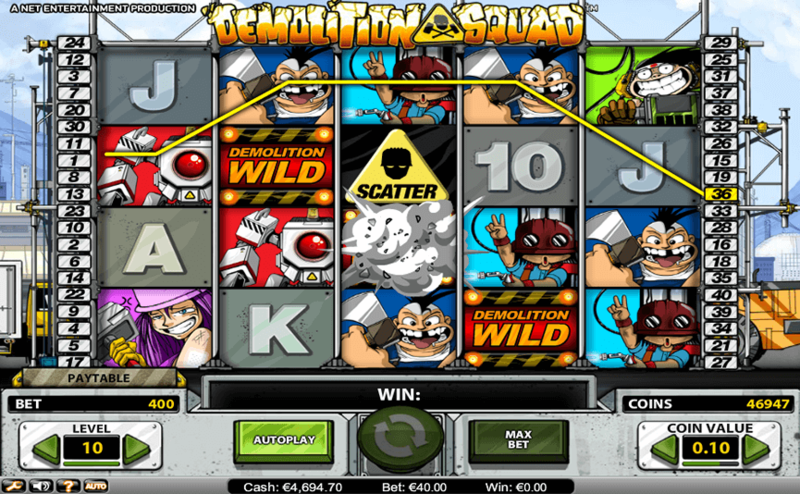 Demolition Squad by NetEnt has always been a firm favourite for players that like to play with big bankrolls as you can bet as much as 400.00 per spin and have the chance at netting some incredible payouts. Containing an RTP of 97.10%, this medium variance slot also offers up some good bang for the buck and the potential for walking away with a good amount of profit. 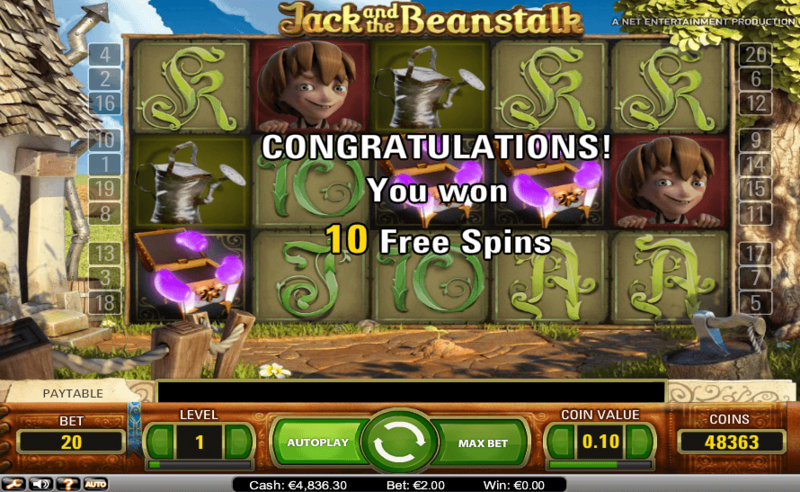 Another reason for its popularity is no doubt a free spins round that can see players rewarded with as many as fifty. On top of that immense amount of free spins is a multiplier of 3x that is attached to any winnings that come from them. Graphics are also of the standard that you expect from NetEnt while the soundtrack definitely helps to immerse you in the theme and action that the slot provides. Even though this online slot is approaching its 5th birthday, it is still one that is regularly enjoyed by players at the online casinos and thus deserves its rightful place on this list. 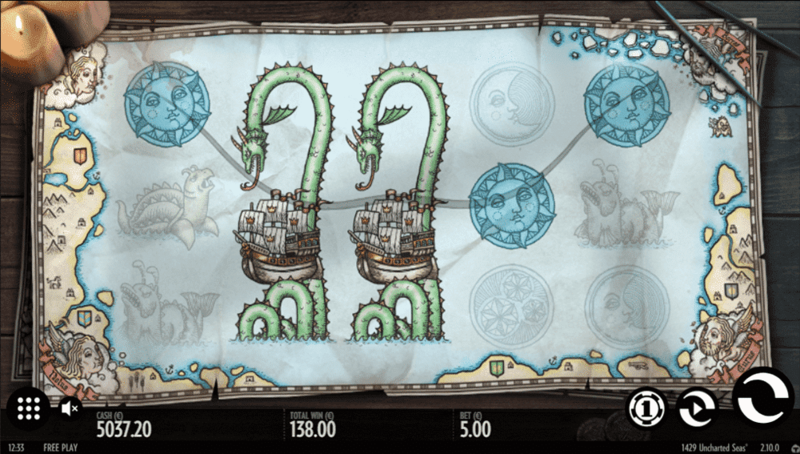 Theme Park Tickets of Fortune by NetEnt is one of those online slots that we feel is a little bit underrated and does not get the credit it deserves from some players. Released last year in 2016, this 5-reel, 25-payline slot actually has a lot going for it and is an online slot that we find highly enjoyable. Why is it so enjoyable? Basically, due to a large number of bonus features that can be found present in the slot. 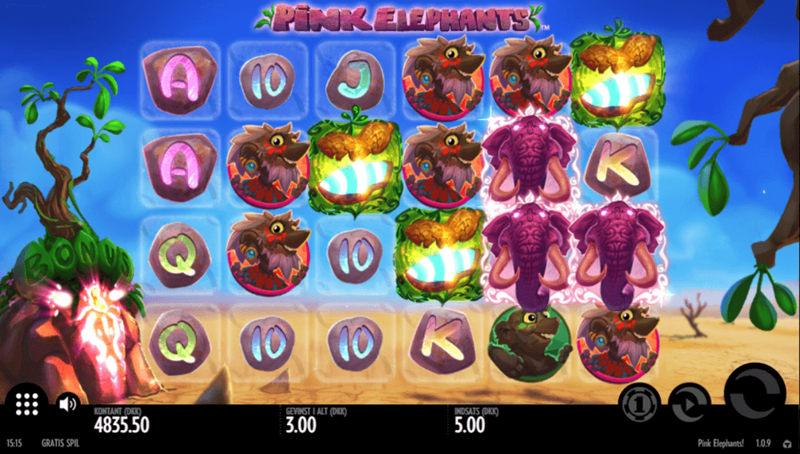 There are six different mini-games as well as stacked wilds and a fun Claw feature. 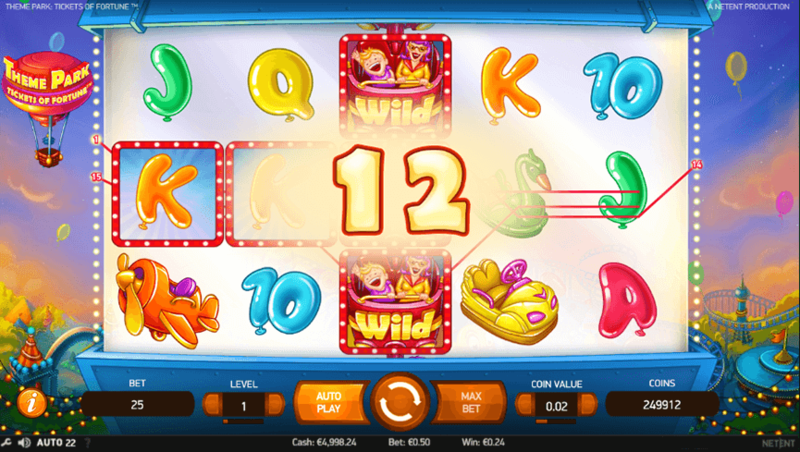 Couple those wonderful features with some HD graphics and animations that work seamlessly no matter what device you are using and you have yourself an online slot that not only looks great but also provides endless hours of fun. 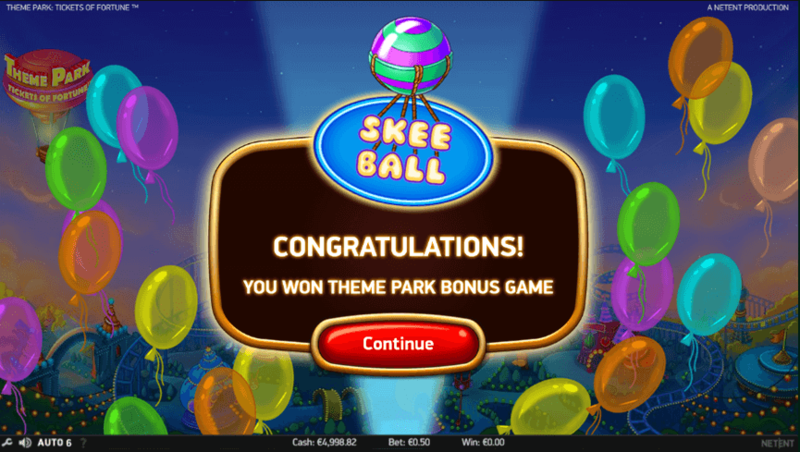 Theme Park is a low variance slot which means regular payouts and has an RTP of 96.52% which makes it an excellent choice for those of you with limited budgets that want to enjoy some fast-paced action at the online casinos. 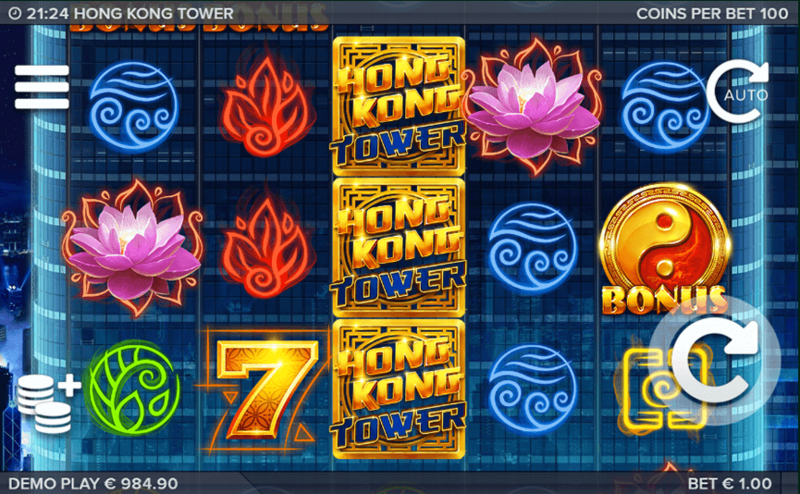 Hong Kong Tower is a relatively new online slot that was only released earlier this year but many players have claimed that it is definitely one of the best releases of the year. 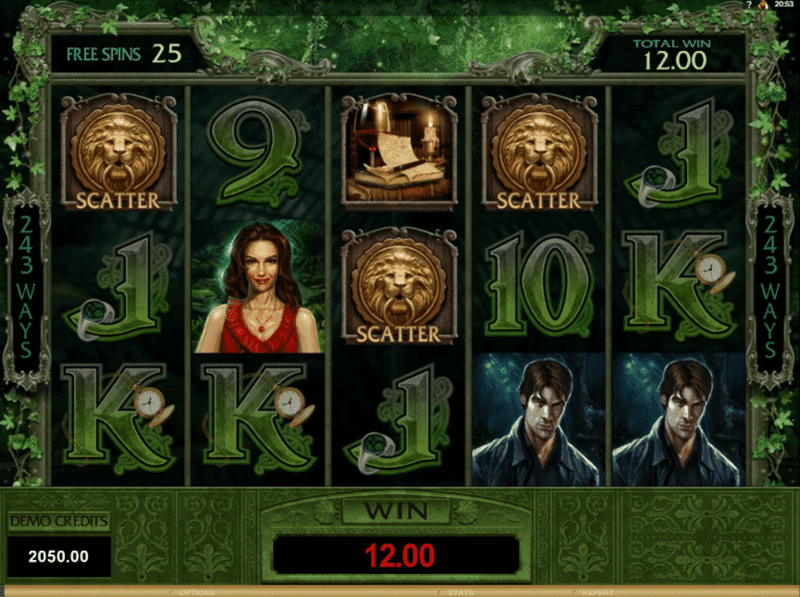 Created by ELK Studios, this aesthetically beautiful 99-payline slot was designed in a mobile-first manner and it looks fantastic no matter what device you are using to play it. Another big reason for its popularity is no doubt the big jackpot of 300,000 euros that is on offer if you bet the maximum spin amount. That is huge for a local jackpot and is essentially 3,106x the total spin bet. 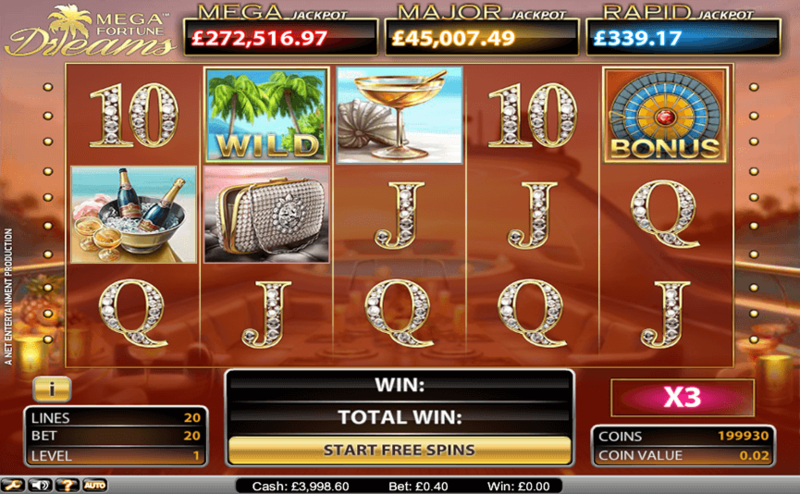 It really is little wonder that so many players are raving about this fantastic online slot. 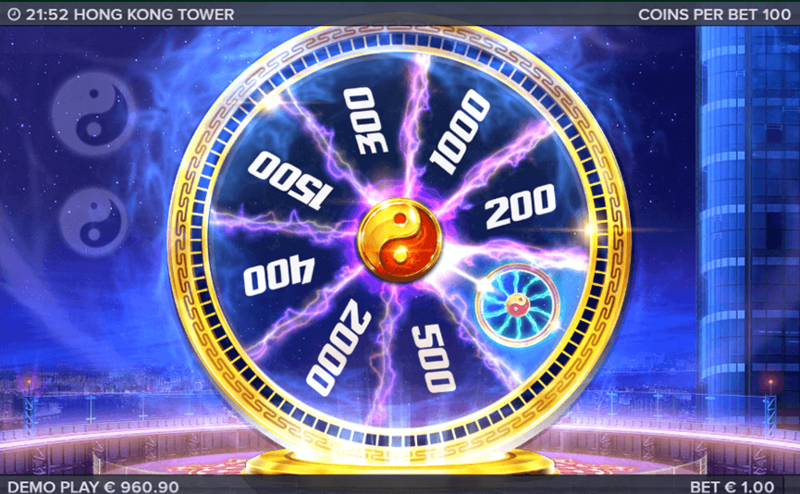 Hong Kong Tower does not let you down with its features either, as this 96.30% medium variance slot has stacked symbols, wild symbols, scatter symbols and its main bonus feature, the Wheels of the Sky. 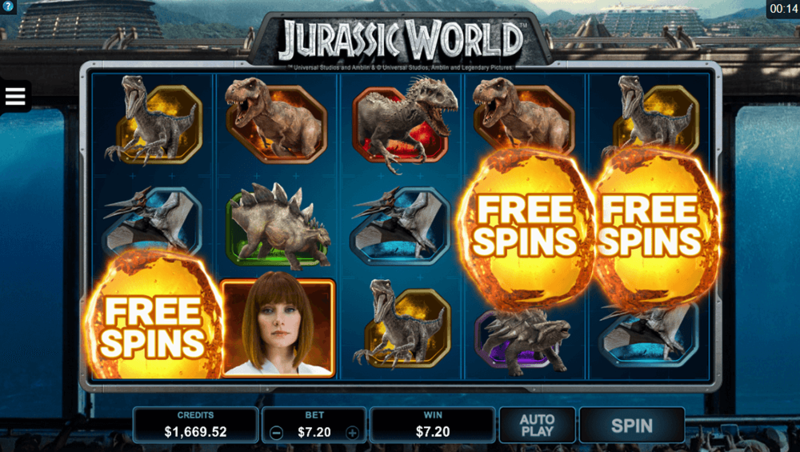 Admittedly, a lack of free spins is a little disappointing but these features more than make up for it. We all remember the blockbuster Jurassic Park movie franchise that made tons of money at the cinemas worldwide. However, the online slot depiction of the latest movie is also massively popular due to making tons of money for certain lucky players. Playable across multiple devices and platforms, this 5-reel, 243-ways-to-win online slot by Microgaming comes with brilliant graphics, ultra-smooth animations and a plethora of lucrative bonus features. 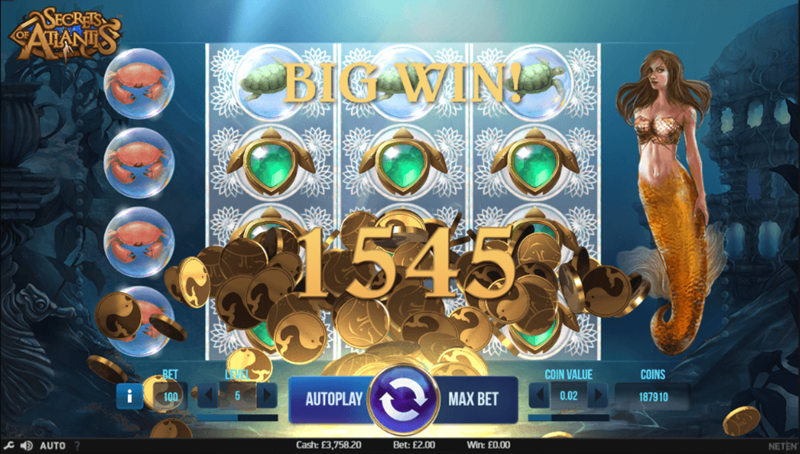 With a medium variance level and an RTP of 96.38%, there is always a chance at some welcome payouts and with features like wild symbols, scatter symbols, multipliers, a bonus game and three different variations of a free spin round. 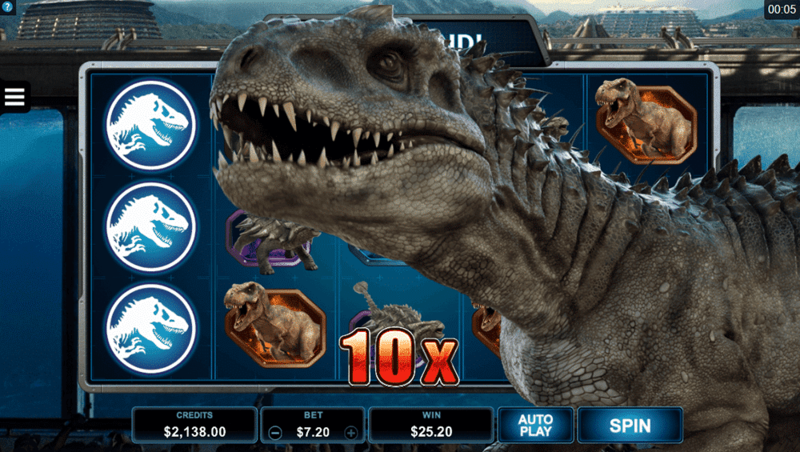 Microgaming, the oldest casino games developer around, has always been known for delivering online slots of the highest quality and Jurassic World is certainly one of their best and rightly deserves a spot on this list. 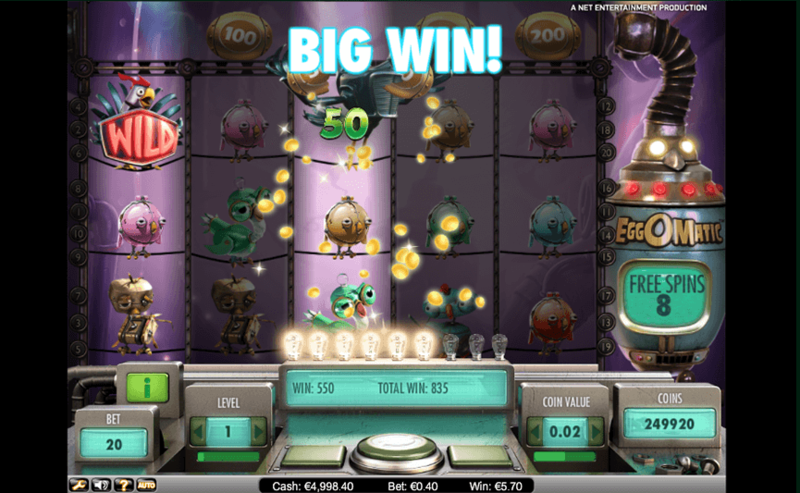 Almost anyone that has played online slots for an extended period of time will have heard of, if not played, Mega Moolah. This legendary progressive slot by Microgaming is so well known for its ability to pay out massive sums of money that it is fittingly known as the ‘millionaire maker’ at the online casinos. Having been around since 12008, Mega Moolah actually holds the record for the single largest payout ever being won at an online slot. That magic number was a staggering 17,879,645 euros which were won by Englishman Jon Heywood back in 2015. As for the slot itself, it has 5-reels, 25-paylines, an RTP of 88.12% and has bonus features like free spins, multipliers, wild symbols, scatters symbols and an excellent wheel spin feature. 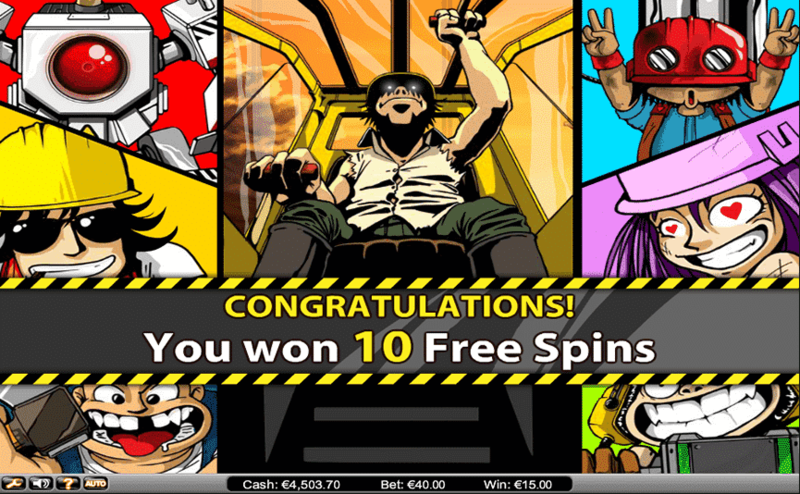 Playable via instant-play through a browser or through download, Mega Moolah is almost ten years old and is still one of the most popular online slots at the online casinos. Do you think those huge progressive jackpots might be the reason? 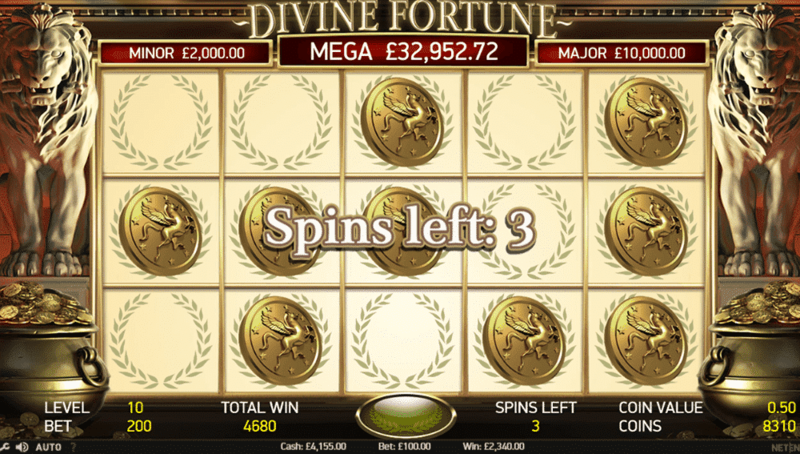 It is easy to see why NetEnts Mega Fortune Dreams Jackpot is so popular as this progressive slot has an average jackpot payout of close to 4,000,000 euros. In fact, there are three different progressive jackpots that can be won, the Rapid, Major and Mega. Can you imagine what it would feel like to become an instant millionaire? 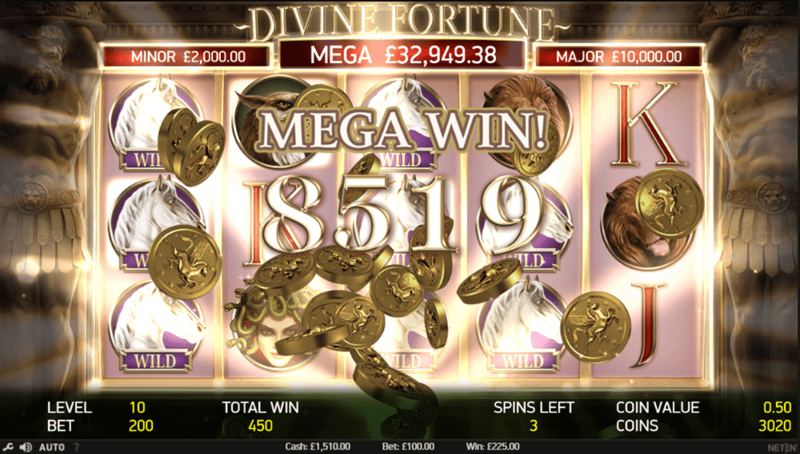 A sequel to mega Fortune jackpot, this is another popular progressive slot by NetEnt full of potential, with excellent gameplay and plenty of bonus features. This slot has a 5-reel, 20-fixed payline reel format and sums up a NetEnt slot perfectly through some fantastic graphics and animations. One of the main reasons Mega Dreams Fortune Slot is undeniably one of the leading online progressive slots today is that it has a 96.4% RTP, which is high for a progressive slot. You can also expect a flurry of features. 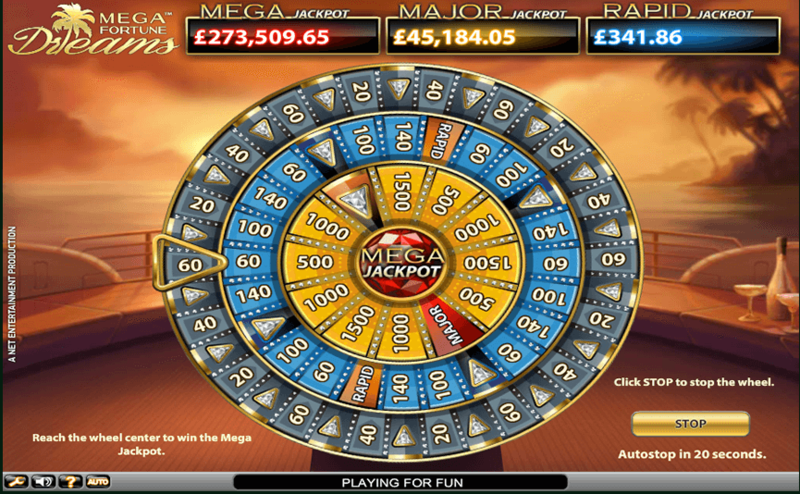 Wild symbols are the key to re-spins, a Diamond scatter unlocks a free spins round with up to 20 free goes plus multipliers, then the Mega Fortune Bonus has its own bonus scatter to open up the Mega Fortune Bonus Wheel where you could potentially win one of the progressive jackpots. If you don’t hit the jackpot, at the very least you will come out of the bonus round with something to show. How can a slot with all of the above features, plus one that gives you the chance of winning life-changing money not be on this list? 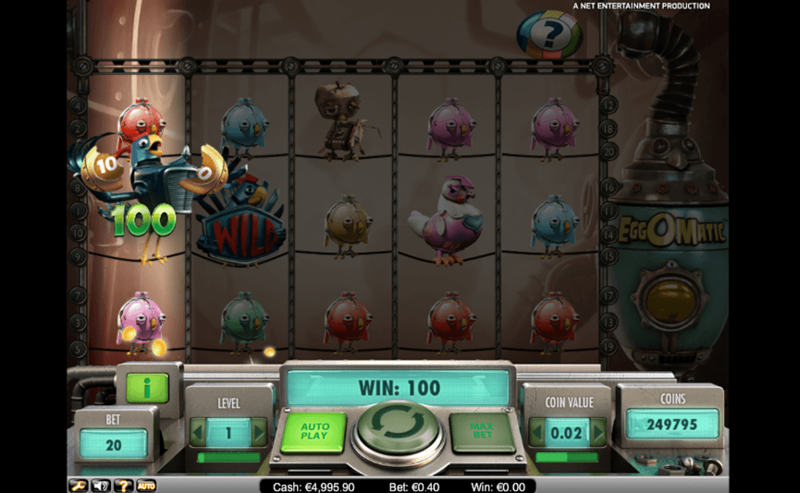 There is nothing like an online slot that tries to be different from the norm, and that’s why players really love what EggOmatic from NetEnt has to offer. This unique 5-reel, 20-payline slot carries and RTP of 96.50% and is a medium volatility slot. Slot players love the enjoyable gameplay with some decent payouts and great features that have been the reason for EggOmatic standing out on the slots scene. To the right of the reels, you will see a dispenser that churns out eggs that then move across a conveyor belt at the top of the reels. Each of these eggs will represent a different feature that you can unlock. Once you land a Wild Rooster symbol on a reel, the egg and its feature above are triggered. 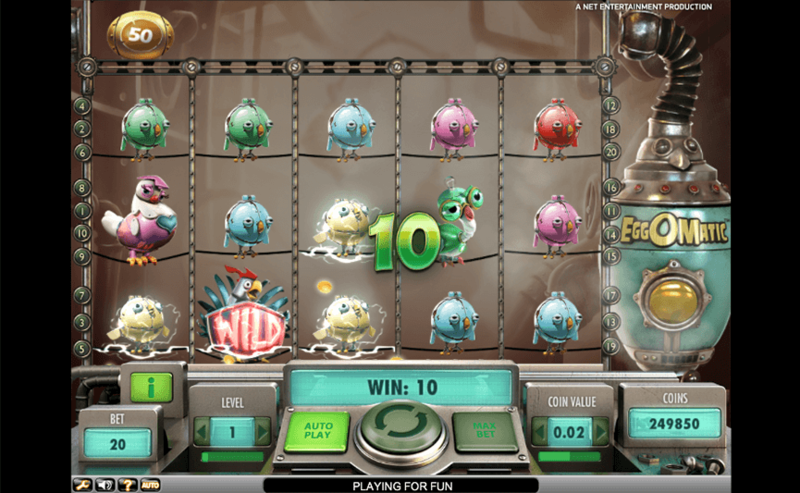 Among the features in those eggs are free spins, random coin wins, wilds and a random surprise. Despite being around for a good few years now, EggOmatic is still a popular choice at the online casinos thanks to a great and unique feature bonus providing an experience that no other slot can come close to. Bringing a close to this list of high-quality online slots is Castle Builder II by Rabcat and Microgaming, a sequel to the massively popular original that was nominated for the EGR Game of the Year Award back in 2013. Only released a few months ago, Castle Builder II is themed around those kingdom building games you can play on mobile such as Clash of Clans. All of the action takes place across 5-reels and 15-paylines. 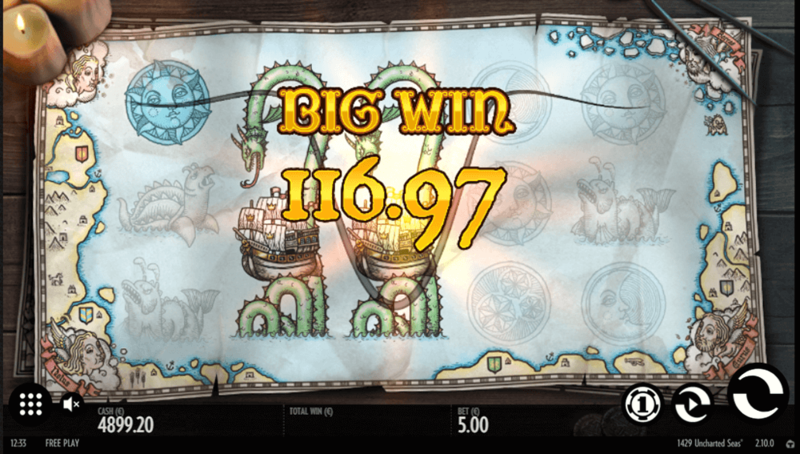 As soon as you start spinning away, the wins are sure to keep flowing in at reasonable levels as this is a low to medium variance slot with an RTP of 96.75% attributed to Castle Builder II, which is more than solid. Its features such as wild symbols, scatter symbols, a Royal Wedding feature and free spins with a twist have made this an incredibly popular slot giving reason to why slot players that tend to also be online gaming enthusiasts have flocked to this enjoyable slot. Which Slot Developer Has the Best Games? The leader of best slots provider is for sure Netent, I would have hoped that I could have added some more Microgaming slots to this ‘Top 30’ list, but unfortunately, it seems Microgaming often forgets how to make great UNIQUE exciting games. Admittedly, Microgaming has introduced some excellent new concepts over the last few years including the non-payline 243 Ways to Win slot. 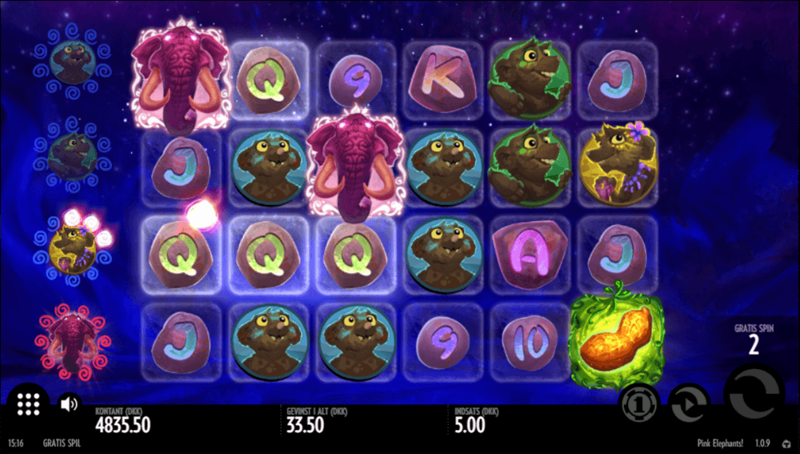 In fact, Microgaming even shared the 243-Ways concept, so developers like Net Entertainment could release their own slots using the no-payline concept. However, the most recent Microgaming titles have been a little too samey as of late. Coming in second just being clipped by NetEntertainment is Elk Studio. The up and coming developer has really surprised me positively with the unique exciting games they have made, and I hope they keep up the great work. Having new slot developers like Elk Studios bringing out new releases with a different dimension to every one of their new slots is a breath of fresh air. It shows that Elk studios have taken the competition seriously. The company has realised that for its games to stand out in a competitive online slots industry, every new release needs to be as special as the last slot. Well done Elk Studios! 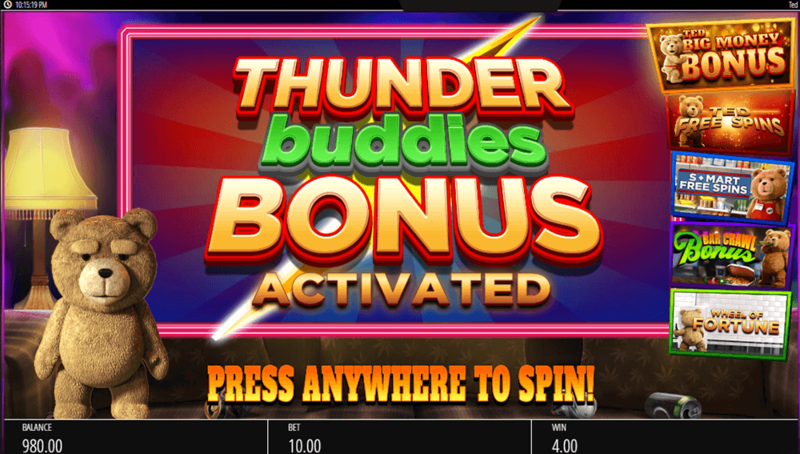 Thunderkick is also creeping up, but this new slot developer are still not quite up to the mark of Microgaming. 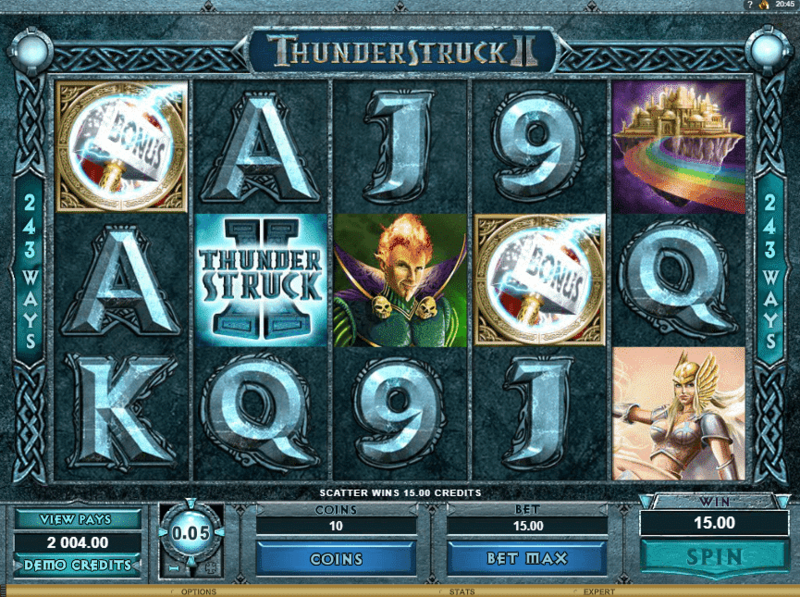 Thunderkick is one of the newest developers on the scene only breaking into the online slots industry in 2012 with some remarkably different slots. The diversity Thunderkick has added to the diverse array of online slots available is nothing short of brilliant. The company entered the slots industry with some daring slots that were at first quite simple in design. However, UK players loved the simplicity and took Thunderkick slots like a duck to water. Their fast-paced action-packed themes have turned heads within just 5 years of the company’s inauguration into the online slots world. Keep your eyes peeled for more slot from this developer because things can only get better. 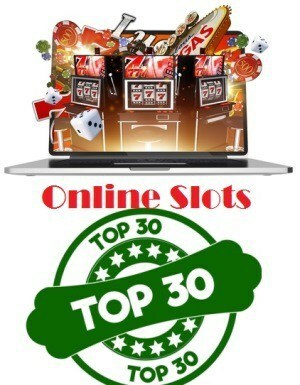 Thank you for reading, and I really hope that you enjoyed our ‘Top 30’ online slots list. We have been playing slots for many years now and, so we decided we would take all our experience and combine it, so we could create this comprehensive list of online slots. Please enjoy, and send in any comments if you feel we missed anything out! We would love to hear your opinion because we understand that there is such a diverse number of online slots players out there, and our list may not mention your favourite slots. If you would also like to mention your favourite slot, we would love for you to share it with us and let us know why you believe it should have been included on our ‘Top 30 Slots’ list.